It’s been awhile since I’ve been able to paint anything for my eBay auctions. Our galleries have empty places on their walls and my collectors have been keeping me busy with collaborations. But I don’t want to neglect all of our eBay collectors, so I’m doing a second piece for Valentines. Now, let’s go to one of Jack’s and my favorite romantic places, Italy! 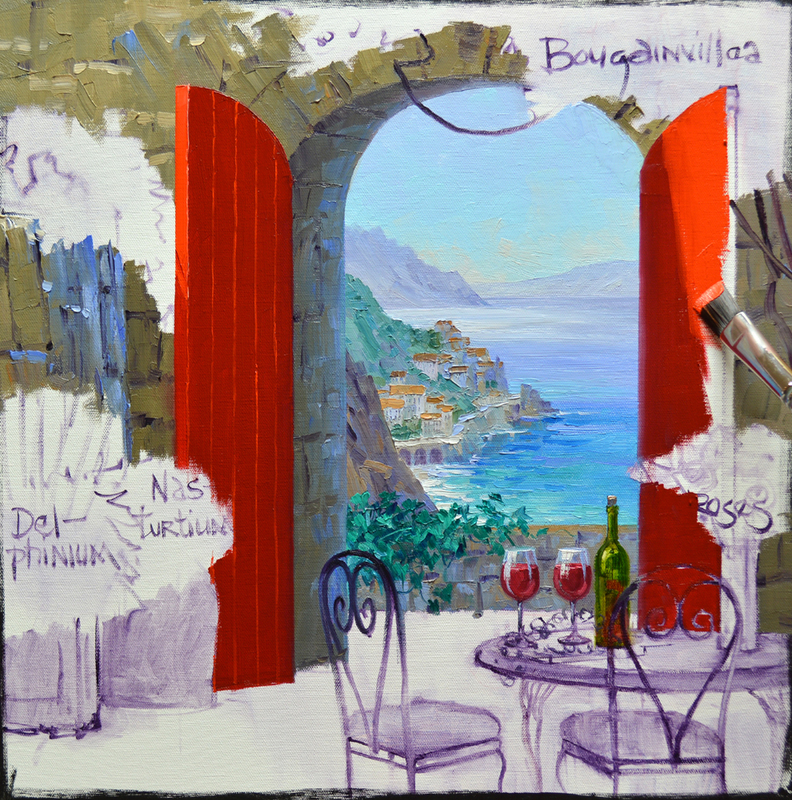 The picturesque setting is perched high on the mountain overlooking the village of Amalfi. To go directly to my auction CLICK HERE. Red is the color of good luck, vitality, long life, celebration, happiness and joy. 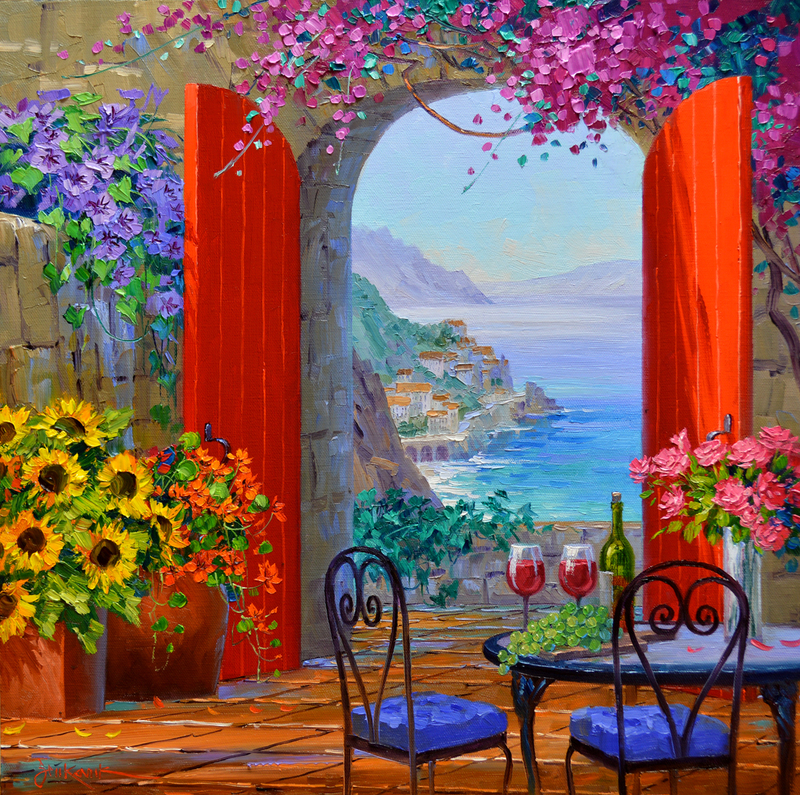 So we’ve got to have vibrant Red doors for our Valentine’s painting. The blue-green of the water in the distance makes them POP! To enlarge this or any of the other images just click on the picture. Even though it’s mid afternoon Morning Glories cascade over the old stone wall. It’s fun being an artist, I can make flowers bloom anytime I want them to! 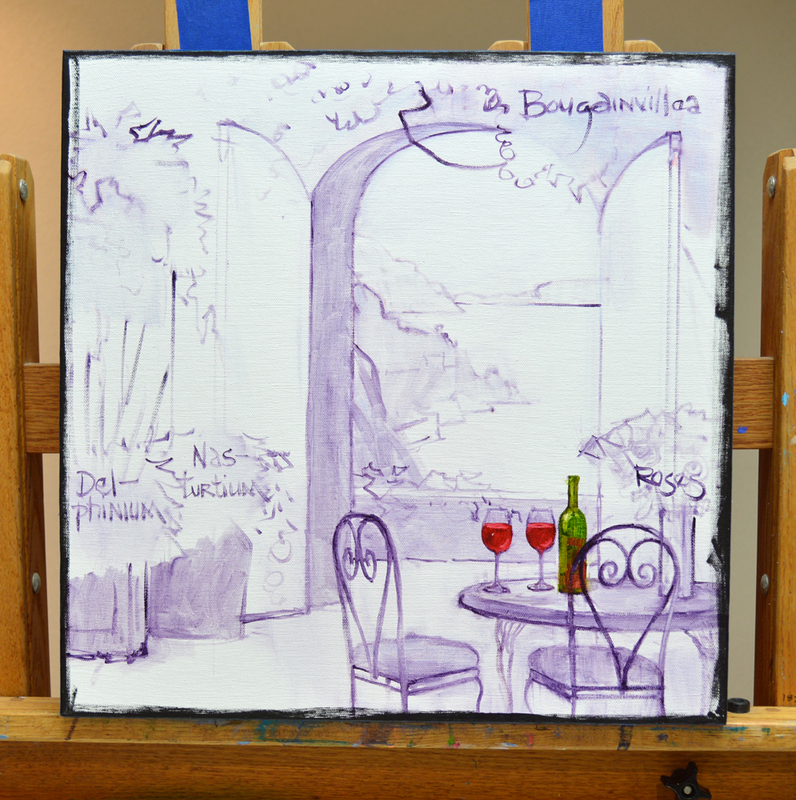 The heart shaped back of the bistro chair is pulled into the wet paint of the tile floor behind. 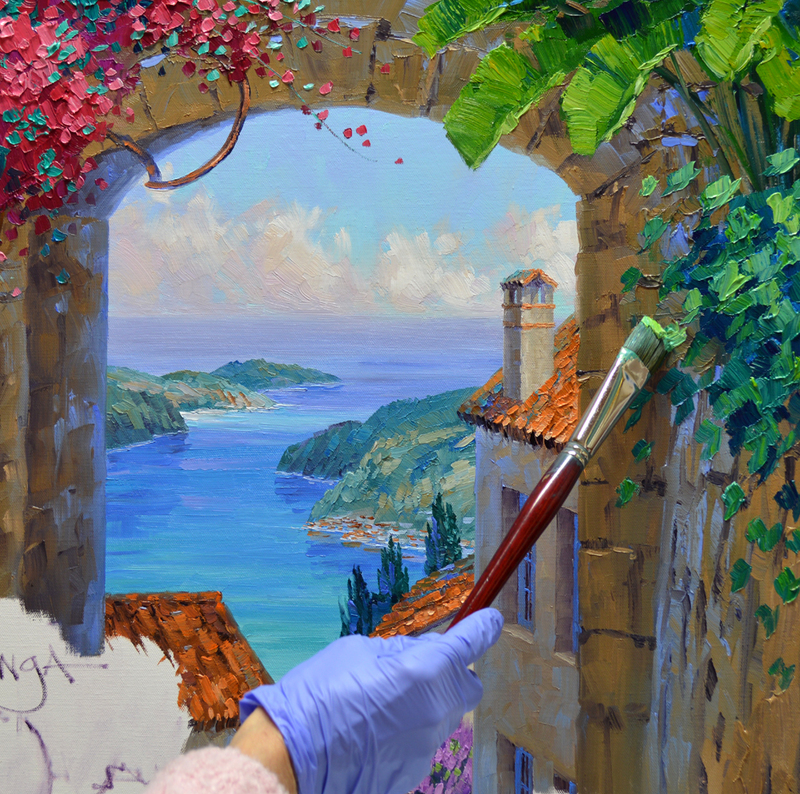 Luscious green grapes are first blocked in with a darker shade of Pthalo Blue + Cadmium Yellow Medium + White. A lighter mix is used to delineate the individual grapes. Pink, the color of LOVE, is perfect for the roses on the table. Nasturtiums tumble out of the container in front of the door. 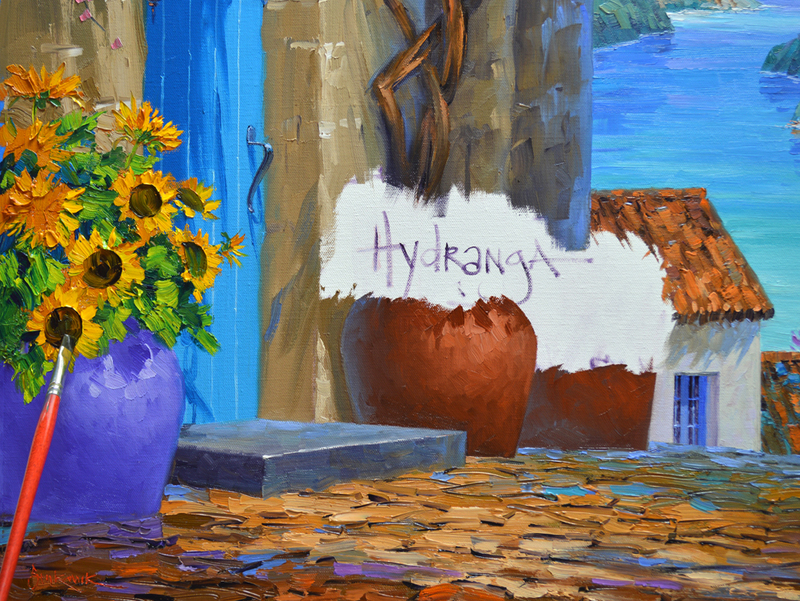 Capture the heart of someone you love with this Senkarik Original Oil Painting. 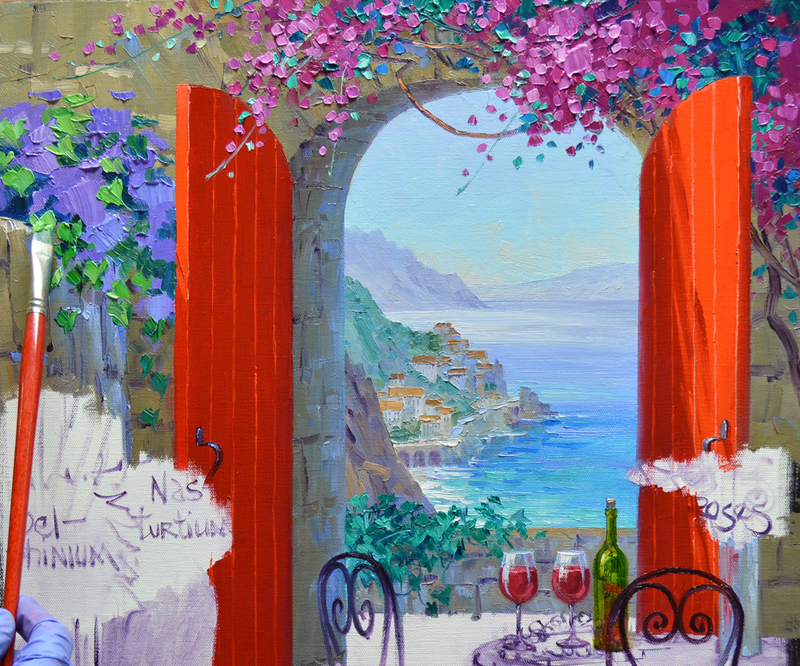 Wouldn’t you just like to relax as you take in the fragrance of the fresh roses, nibble on grapes and share a sip of wine with your Valentine while gazing into the seemingly endless vista of the Amalfi Coast? Give the Elegance of Romance to that special person in your life. 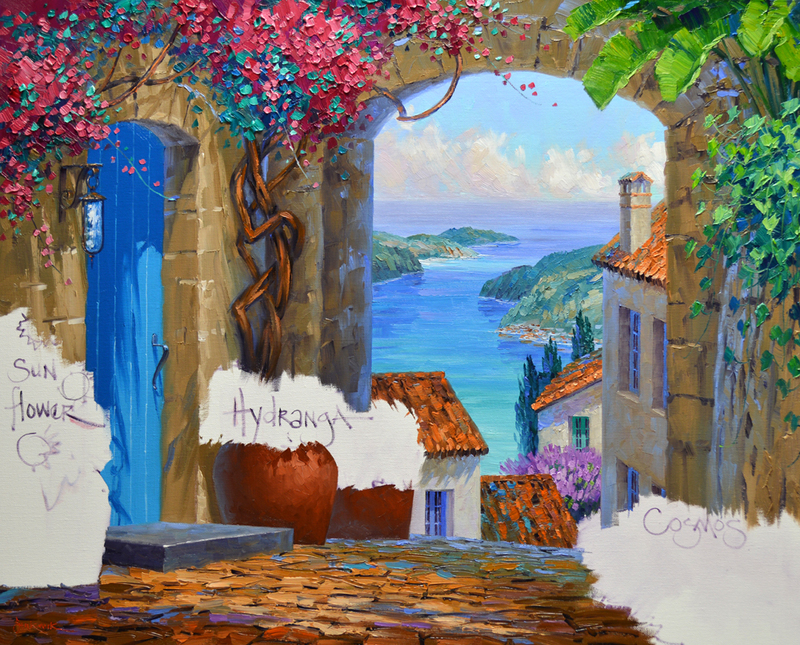 Remember, a Senkarik Original Oil Painting will last for generations, bringing smiles long after candy and flowers are gone. I will be happy to personalize the back with your message to the recipient. Just let me know as soon as possible after you win! Elegance of Romance measures 17 inches x 17 inches. 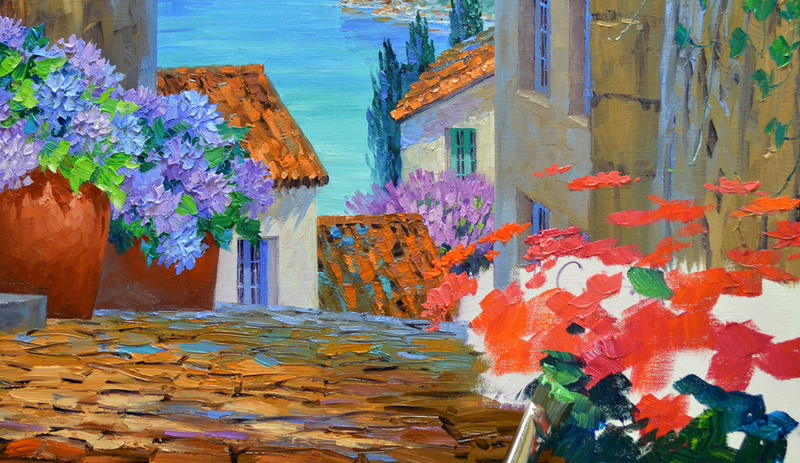 This size painting retails in our galleries for $990. And you don’t have to worry about framing, it’s painted on a canvas with 1 1/2 inch finished sides. We’ve wired it and even include the hanger and nail. 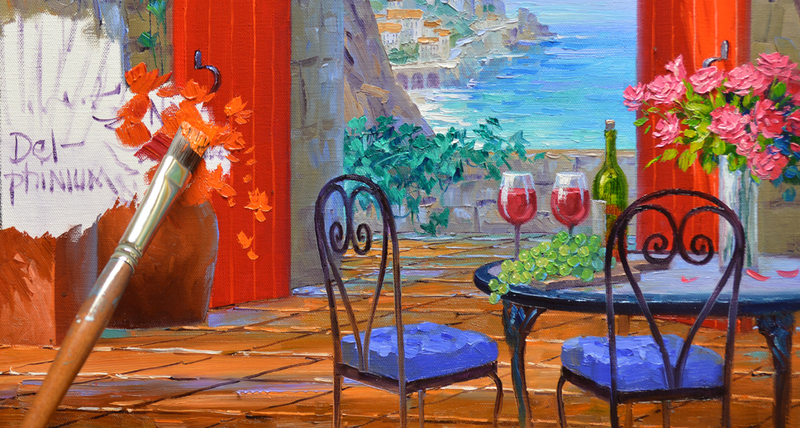 Elegance of Romance is ready to hang as soon as you unpack it! The auction ends Monday, February 2 at 8 PM Texas (Central) Time allowing you to receive it in plenty of time to give for Valentine’s Day. Flower Markets and Umbrellas, I love em! As Jack will tell you, I’ve never seen any I didn’t like! I usually come home with armloads of fragrant, fresh flowers. I’ll be listing this piece on my eBay auction for Valentine’s, can you believe it’s just around the corner? After sketching the basic plan up on the panel I begin blocking in the background wall. CLICK HERE to go to my auction. The setting for our little flower market is constructed. 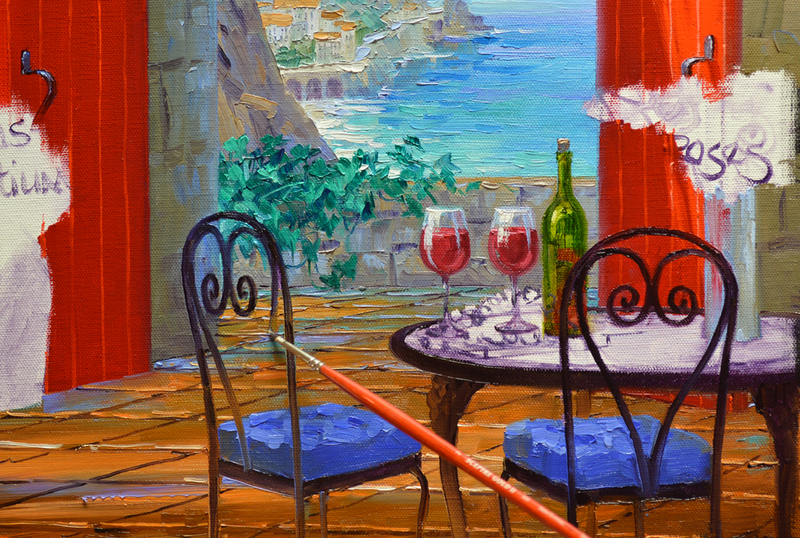 Several of you have asked if I wait to sign my paintings until the piece is finished. As you can see here I don’t. 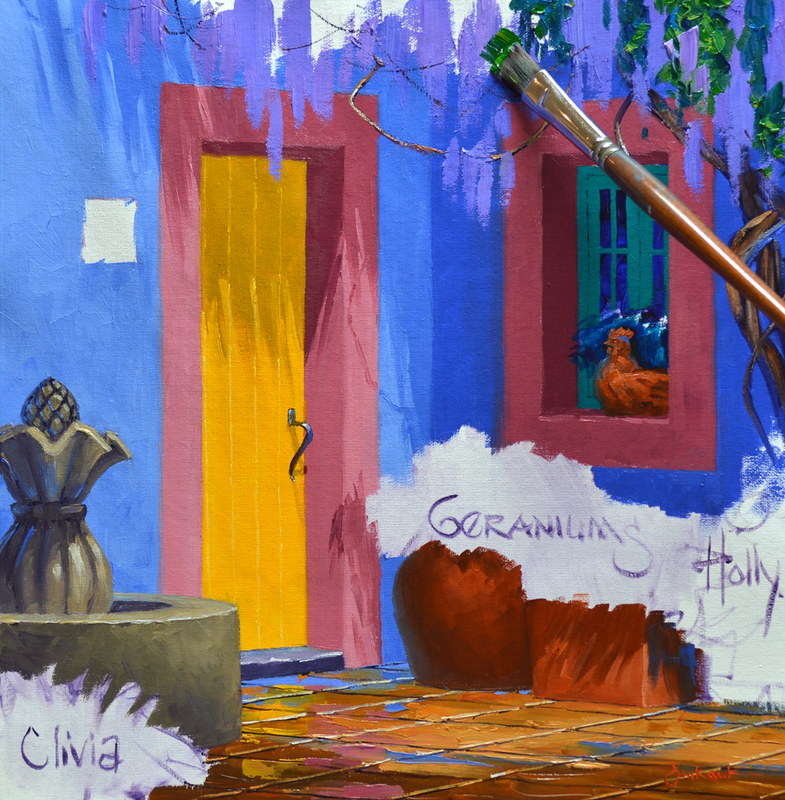 It all depends on when I paint the area where I’m going to put my signature. It’s easiest to make the fine lines of my signature into fresh paint. If I waited until the area was dry it would be difficult to make the thin brushstrokes over the lumps and bumps of the underlying color. Nasturtiums tumble out of the terra cotta containers on the ledge at the base of the wall. The flowers are blocked in with several mixes of Cadmium Red Light + Cadmium Red Deep. 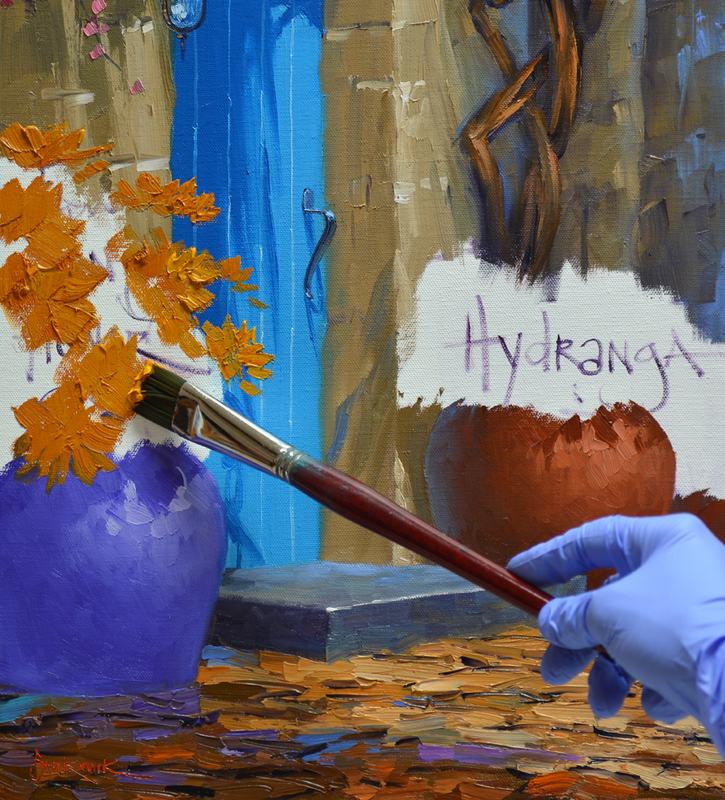 The leaves are then painted with warm greens made of Pthalo Blue + Cadmium Yellow Medium. Now for the bright umbrella. The lightest panel is blocked in with Cadmium Yellow Medium + Lemon Yellow + White. The next darkest panel is made of pure Cadmium Yellow Medium. 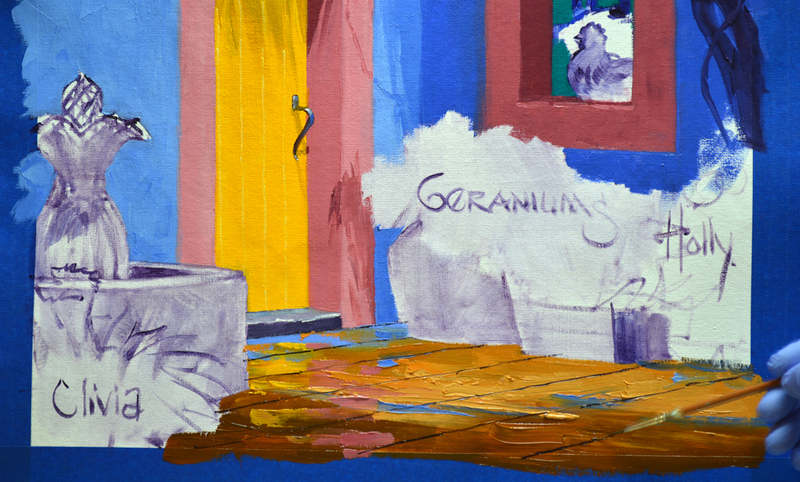 Those in shadow are Cadmium Yellow Medium + Cadmium Orange + a touch of MUD (Ultramarine Blue + Alizarin Crimson). The tall cylindrical pots in the front are perfect for Oriental Lilies. Mexican Bush Sage lazily hugs the base of the containers, making for A Colorful Spot. Wouldn’t you like to take home a bunch of those Lilies? They’d be a perfect Valentine’s gift for someone you love. 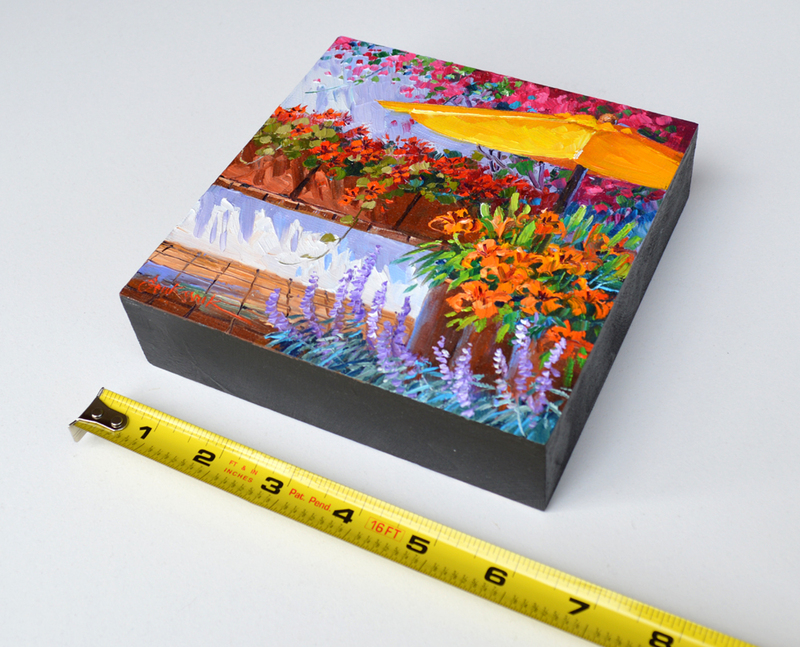 A Colorful Spot measures 6 inches x 6 inches. And don’t worry about framing, the EMBRYO is painted on a panel with 1 1/2 inch finished sides. It’s ready to hang as soon as you unpack it! The auction ends Sunday, February 1 at 8 PM Texas (Central) Time allowing you to receive it in plenty of time to give for Valentine’s Day. This morning I planted some Snapdragons in a large container in our courtyard. But in most areas of our great country it’s way too cold to garden. Fortunately as artists we can plant anytime we’d like on canvas! So, let’s get to gardening. 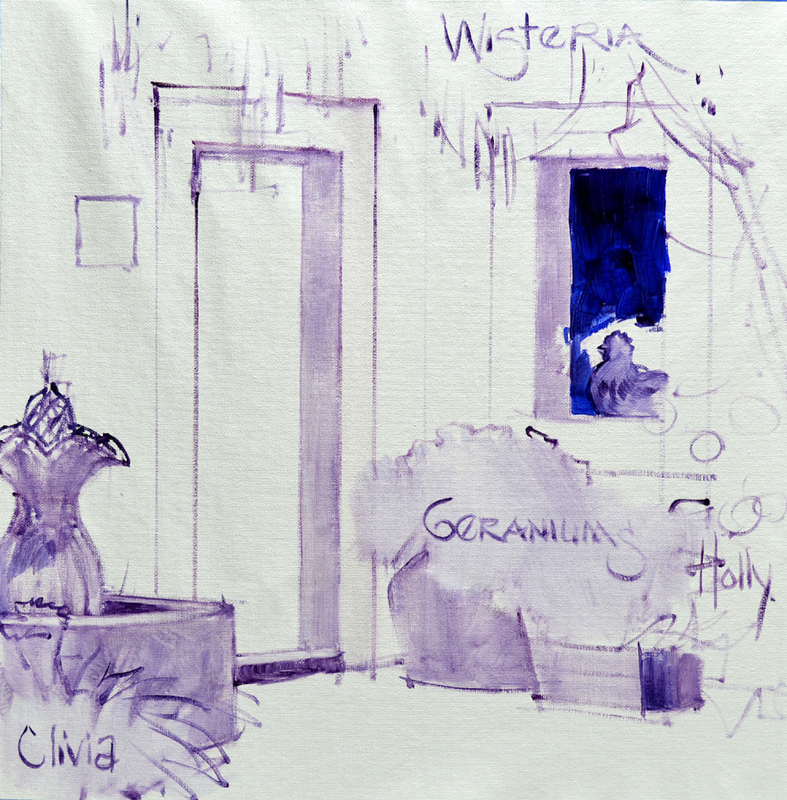 A special color, Dioxazine Purple, is used for the Wisteria. The leaves are then blocked in around the blossoms, helping to give them shape. 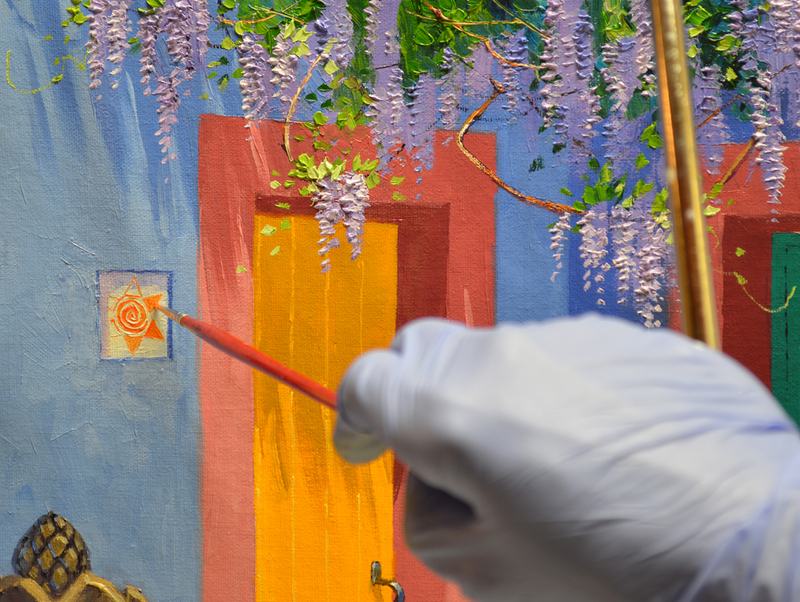 The final touch on the Wisteria is to highlight the individual petals on the flowers. Moving to the wall tile the background is blocked in first. Then bracing my wrist on the mahl stick to steady my hand I delineate the little sun face. Delicate White Daisies fill the little terra-cotta hen on the window sill. Next the water trickling from the fountain is dragged straight down. I let the brush skip over the rough paint underneath, giving the impression of falling water. Following the Flower First, Leaves Last sequence I block in the Geraniums with Cadmium Red Deep, Cadmium Red Medium and Cadmium Red Light. 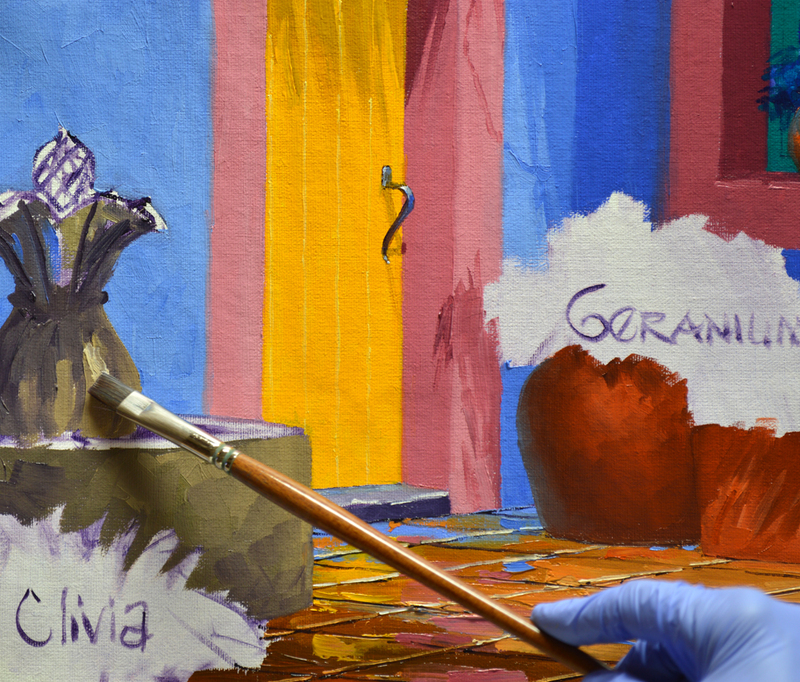 The leaves are painted with several different combinations of Pthalo Blue + Lemon Yellow. 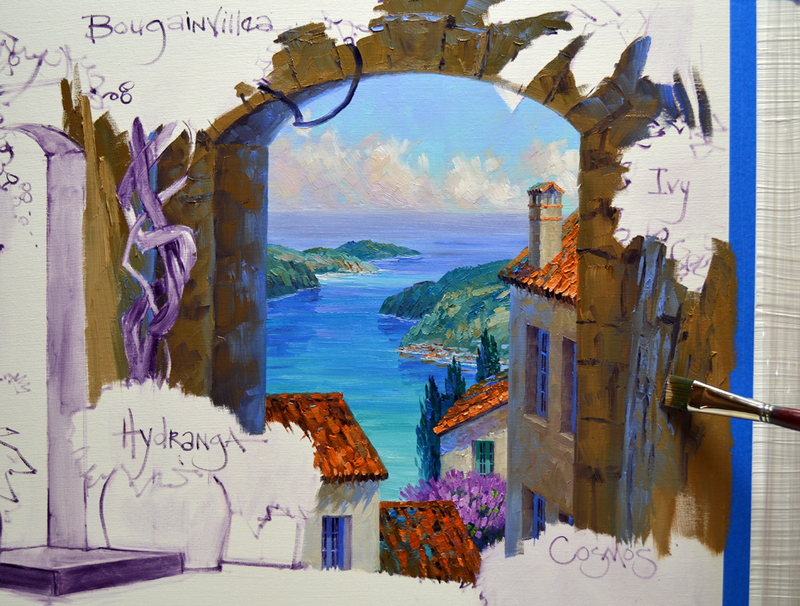 A few strokes of Pthalo Blue + White are made here and there to bring coolness in the depths of the foliage. Permanent Rose Hollyhocks snuggle up to the Geranium containers. 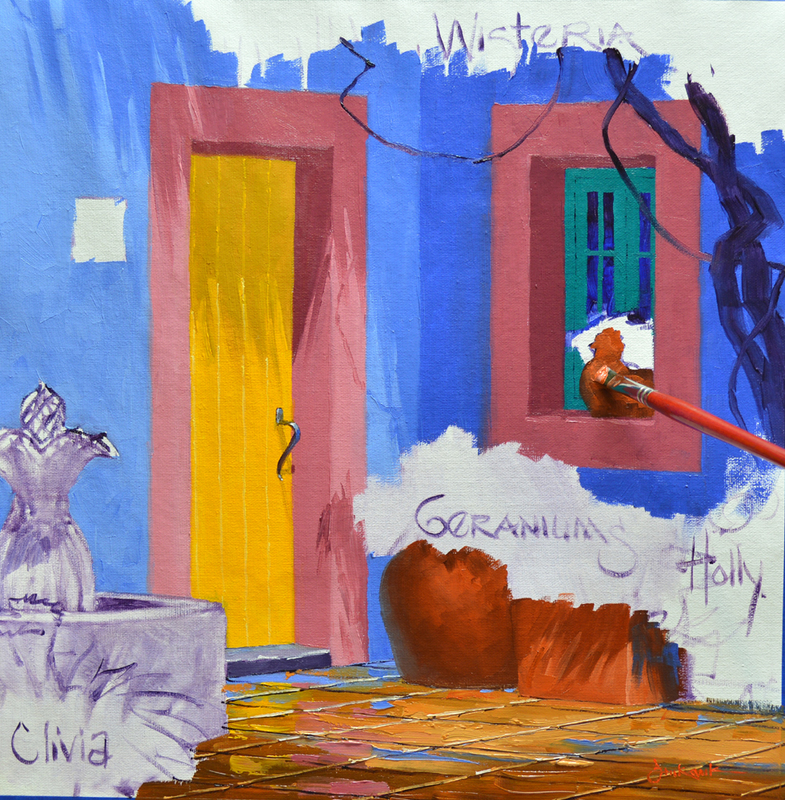 The cheery door is painted with mixes of Cadmium Yellow Deep + a touch of MUD (Ultramarine Blue + Alizarin Crimson) for the shadow and pure Cadmium Yellow Medium for the sunlit portion. Viridian Green + MUD + White is used for the window. The addition of MUD mutes the green so it will fall back into the dim light under the Wisteria. Various combinations of Cadmium Orange + a tiny bit of Pthalo Blue + MUD + White are now mixed. Then the entire area of the old satillo tile is completely painted, establishing the light and shadow pattern. Some of the door, border and wall colors are pulled down into the floor directly below the portal. This will give the impression of reflections when we’re finished. Using a fine liner brush the perspective lines of the tile are drawn freehand into the wet floor paint. After the horizonal lines between the tiles are delineated work begins on the large terra-cotta containers. I just add some Cadmium Red Light into the floor mixes for the planters. 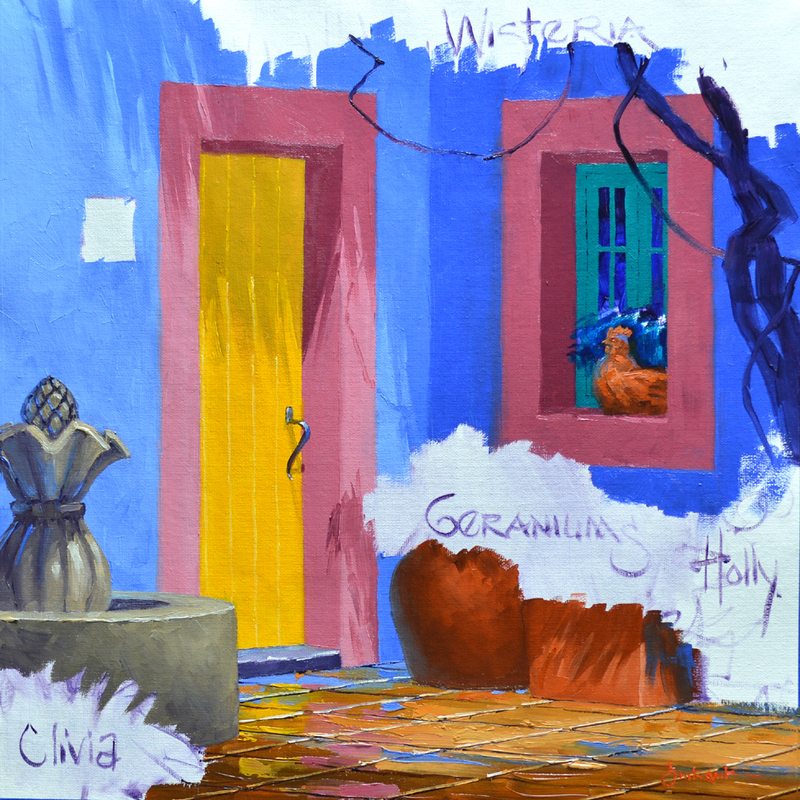 The fountain is painted with an adobe mix made of Cadmium Orange + Ultramarine Blue + MUD + White. The light and shadow areas are blocked in first. Here I come! Or at least this piece is going to the beautiful coastal resort town in Mexico. 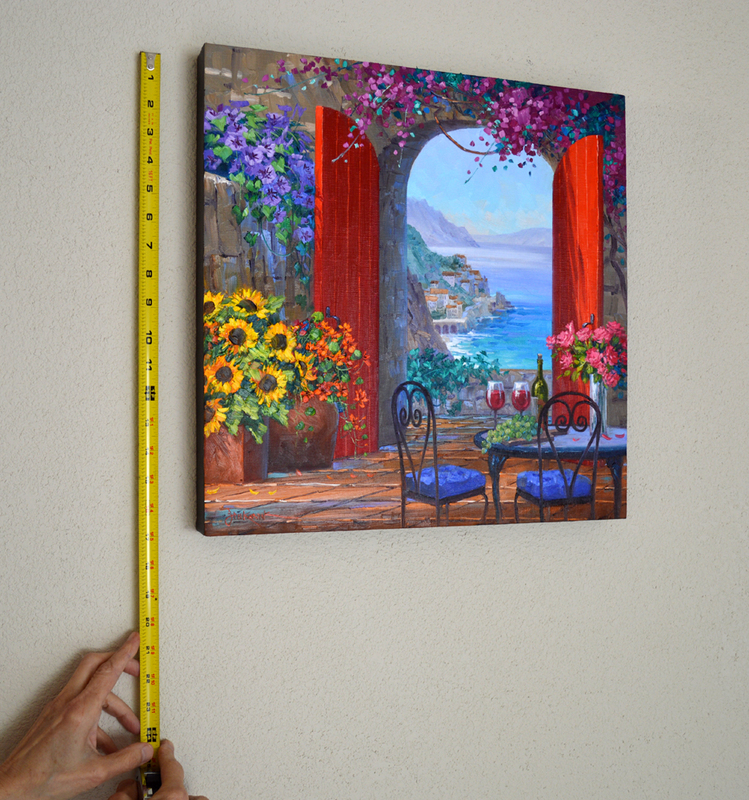 To save on International shipping costs it’s done on unstretched canvas. 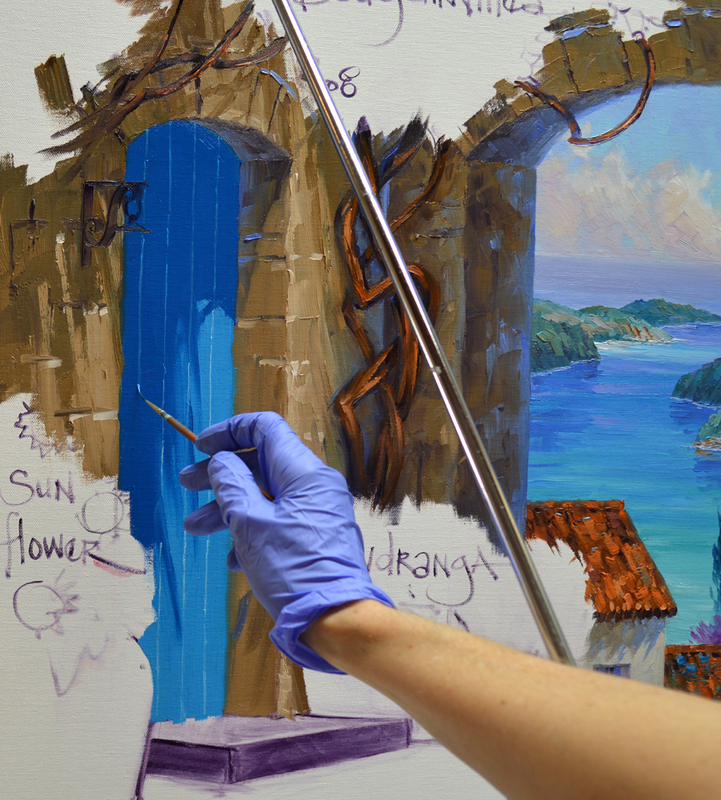 I’m working with Alkyd Oil Paints that dry much faster than regular oils. This allows us to roll the finished painting for it’s journey to Playa del Carmen. 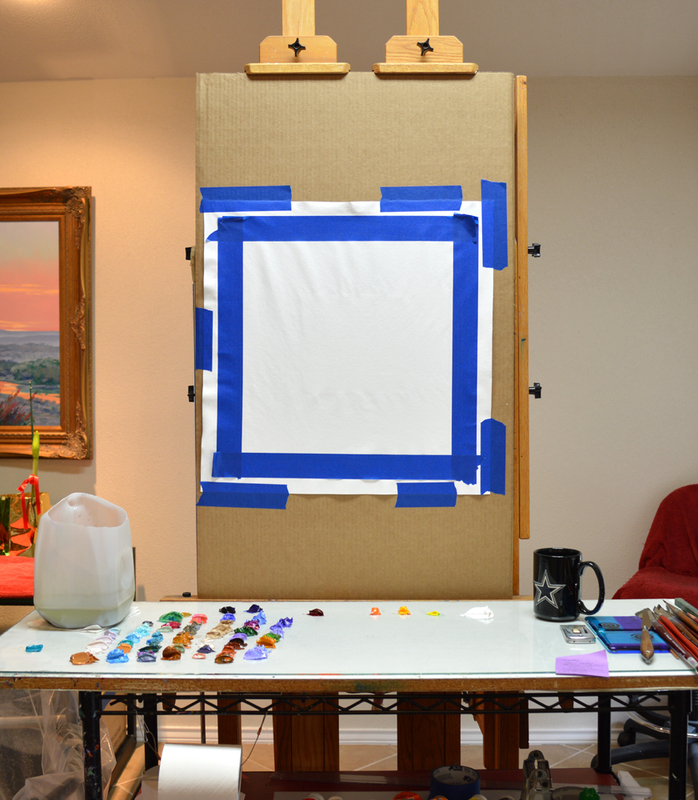 After priming the canvas with white acrylic I tape off the image area, leaving enough extra canvas for stretching. 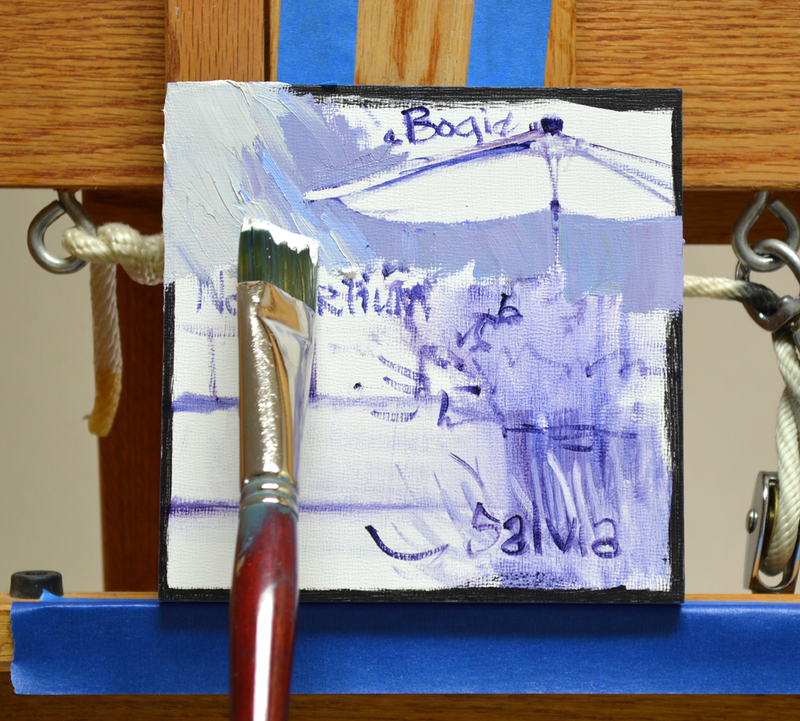 The canvas is then taped to a 4 ply piece of cardboard which is set on the easel. 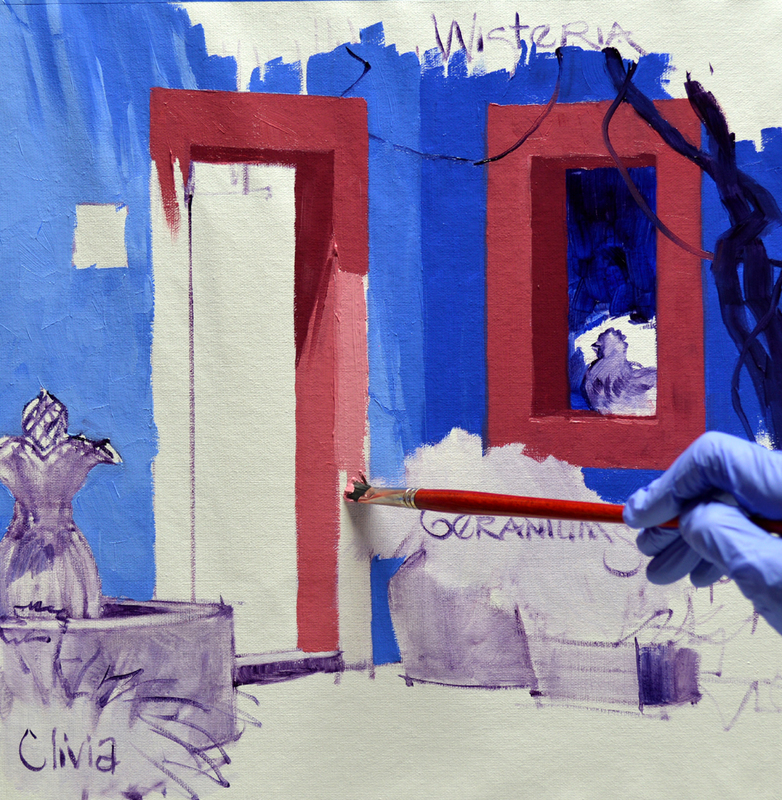 The basic plan is sketched up on the canvas with a brush dipped in a thin wash of MUD (Alizarin Crimson + Ultramarine Blue) + Liquin. 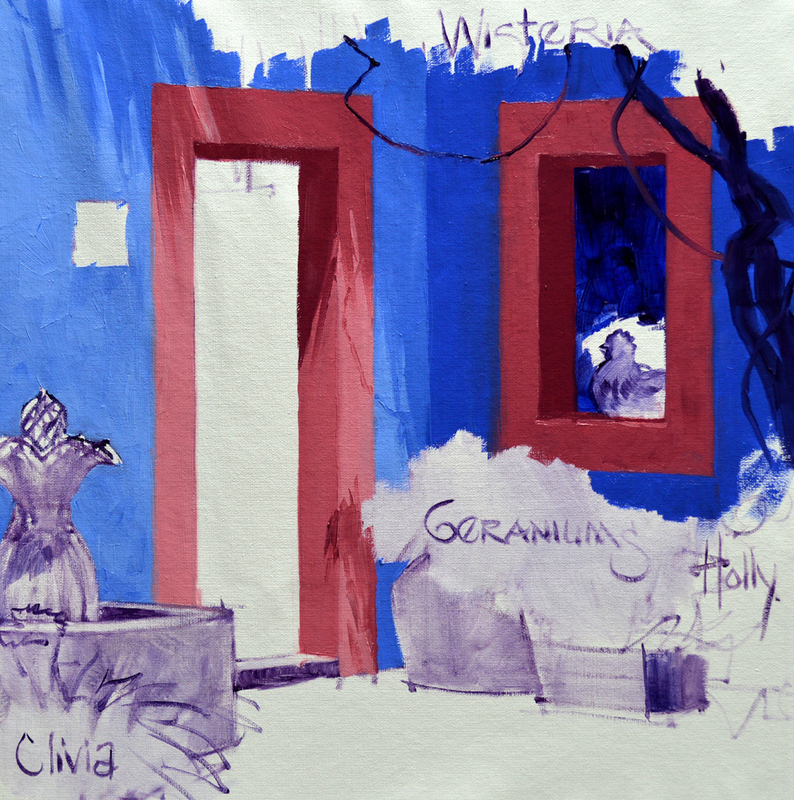 The rich blue walls are covered with mixtures in various proportions of Ultramarine Blue + a bit of Cobalt Blue + MUD + White. 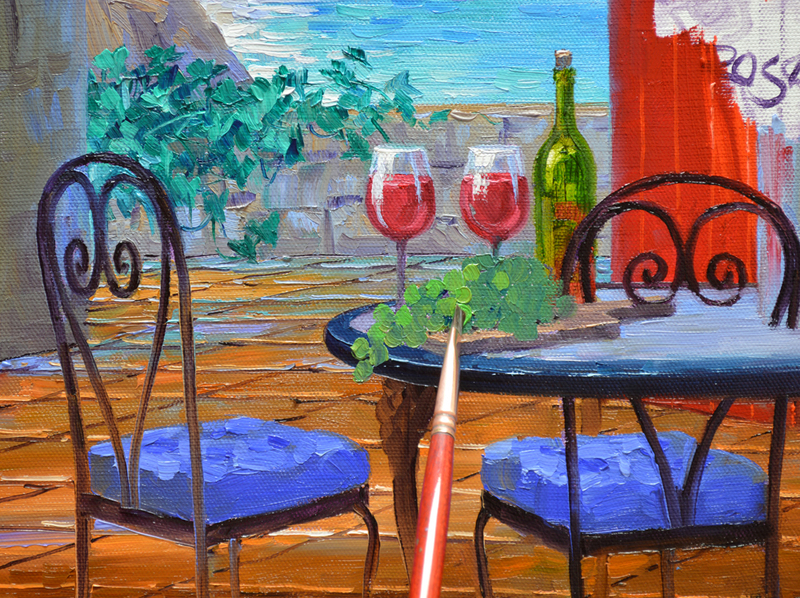 Next the red trim is delineated using light and dark mixes of Alizarin Crimson + a touch of Cadmium Red Light + White. If you’d like to learn more about our Double Primary Mixing system CLICK HERE. The walls and trim are complete. 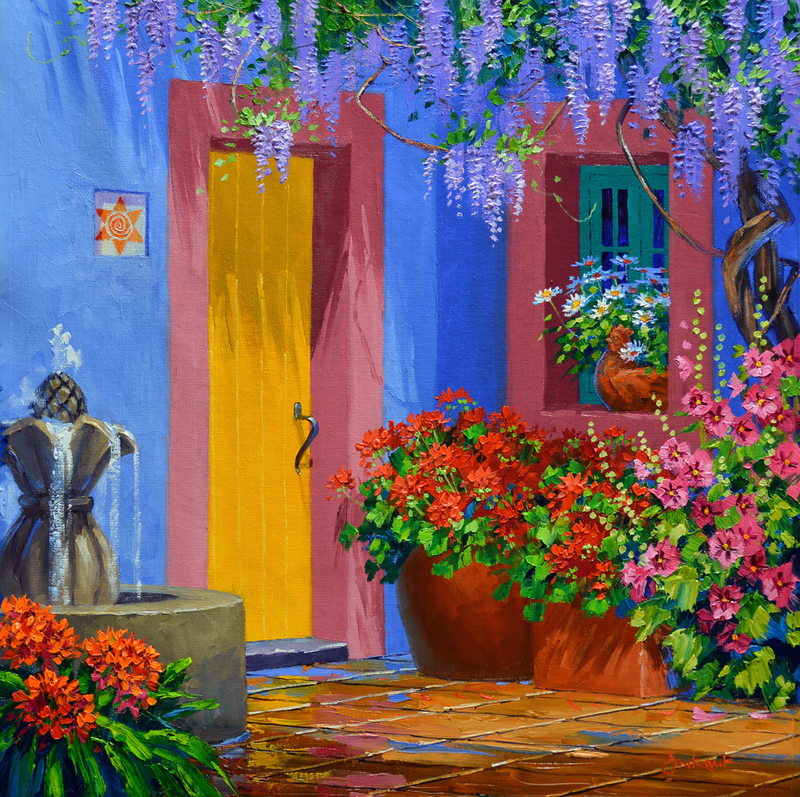 Don’t you think the soft blue is going to be a wonderful backdrop for the bright flowers in this courtyard? 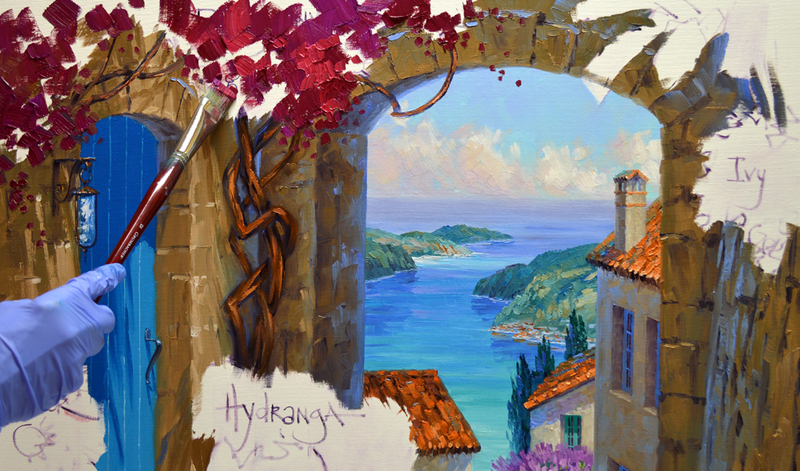 Since Alkyd Oil Paints dry so quickly I’m saving some of the colors to use in our next session. 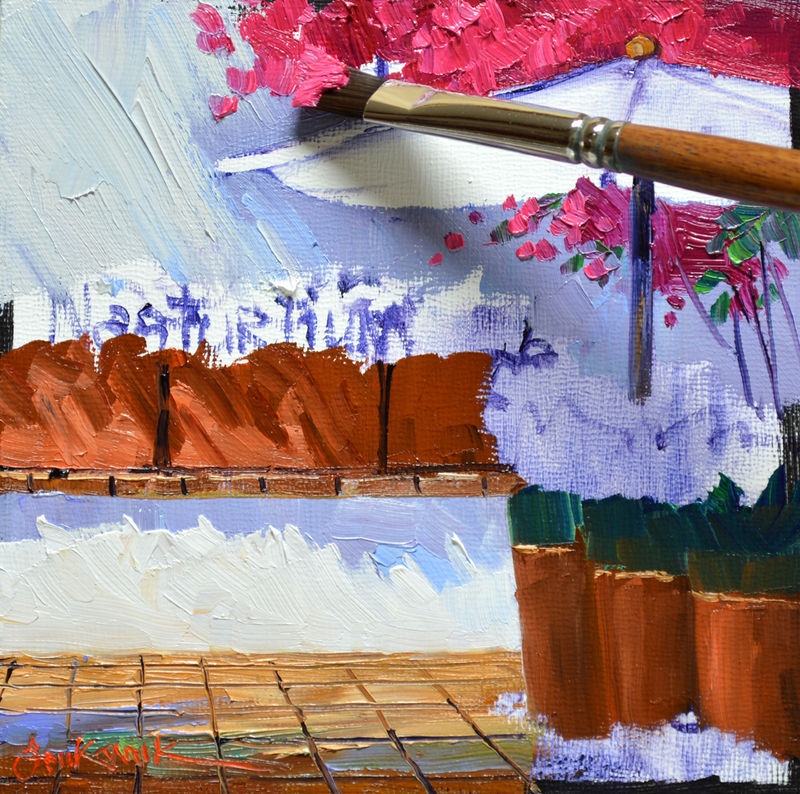 With my painting knife I press dabs of paint against the side of a plastic yogurt container. The cup will be filled with enough water to cover the paint, keeping air from drying it out. To see this better you can enlarge the image, just click on the picture. 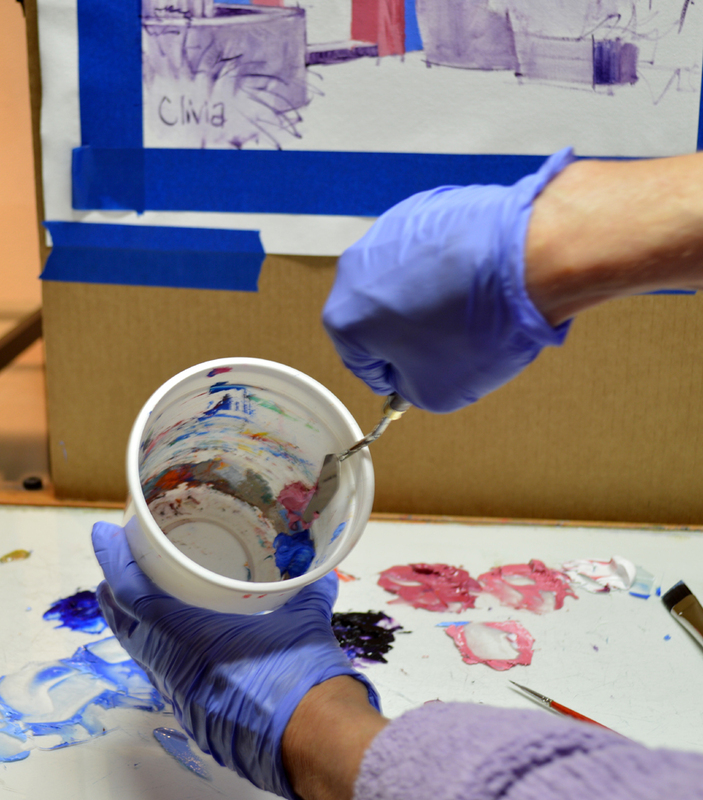 One of our readers had a great question, she asked what paint mixtures are used for painting layers of mountains? Jack and I thought all of you would enjoy this more detailed description of the color recipes. 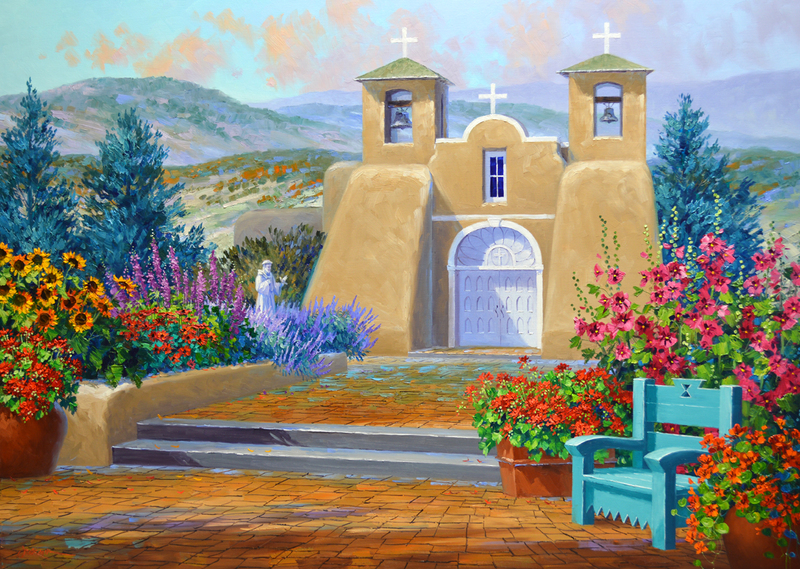 Let’s go back to a painting I just completed recently, Sanctuary of Serenity. I’ve numbered the mountains from the most distant #1 to the closest #4. Please keep in mind, most of these mixes are mainly White with small amounts of the colors mentioned. Number 1. The farthest mountain is painted with mixes of Ultramarine Blue + a bit of MUD (Ultramarine Blue + Alizarin Crimson) + White. Number 2. Pthalo Blue + Ultramarine Blue + a tiny bit of Cadmium Orange + MUD + White. Some of the lightest blues from mountain #1 are used along the lowest part of this one, that gives the impression of the mist between the ridges. Number 3. This mountain uses darker values of the mixes in #2. 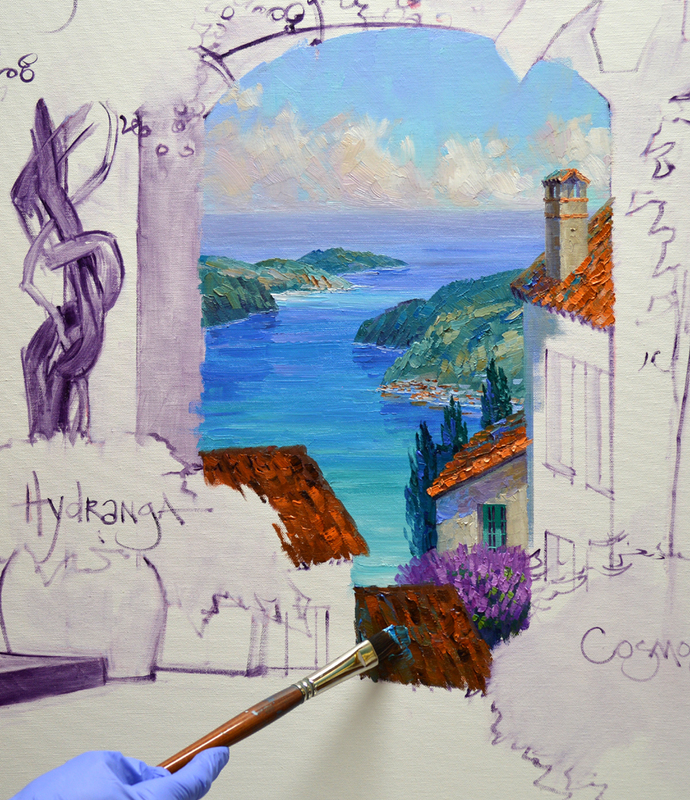 Also a little Pthalo Blue + Cadmium Orange + White is used. You can see strokes of the darker cloud color (MUD + White) is brought in for the ground areas. Also mixes of MUD + Ultramarine Blue + Cadmium Orange + White are made for the ground. All of these mixes have more blue than orange so they will still drop back. Like in #2 the blues from #1 are added in the lowest region. Number 4. On the closest mountain Pthalo Blue + Cadmium Orange + a tiny bit of MUD + White are used for the trees. More Orange is in the greens that are warmed by the sunlight. 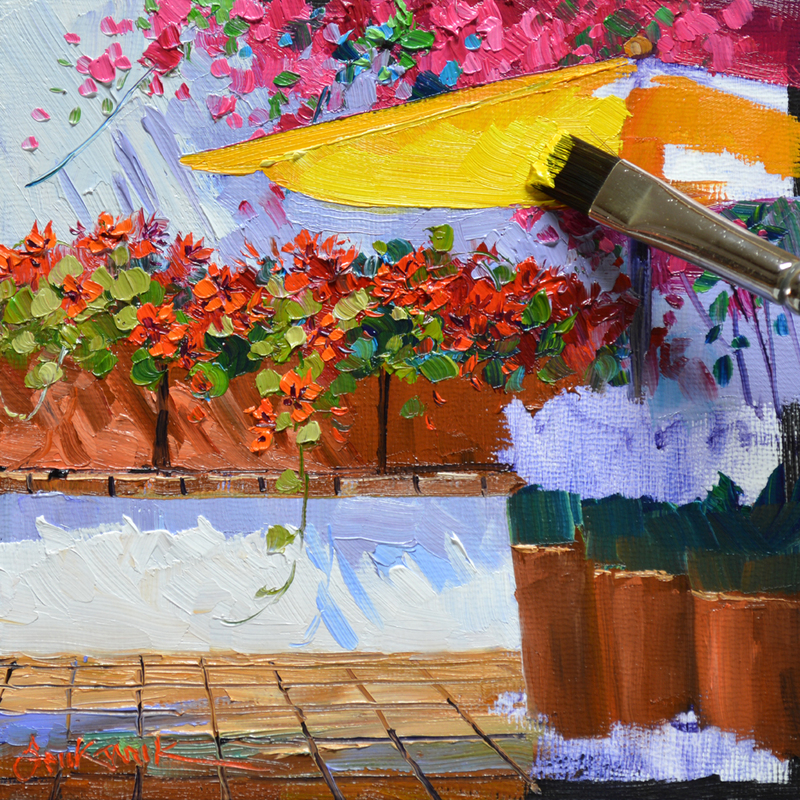 The ground color is White + Cadmium Orange + Pthalo Blue. A little Lemon Yellow is also added into some of the mixes for the light gray-greens of the dried grass covering the hillside. I also make a few strokes using the blues from Mountain #1, just to give a little coolness here and there. Here’s the finished painting so you can see how the coolest mountain #1 recedes. And the warmth of mountain #4 makes it look closer. If you’d like to see the image larger just click on the picture. Another reader asked if I use any reference for the flowers in containers. 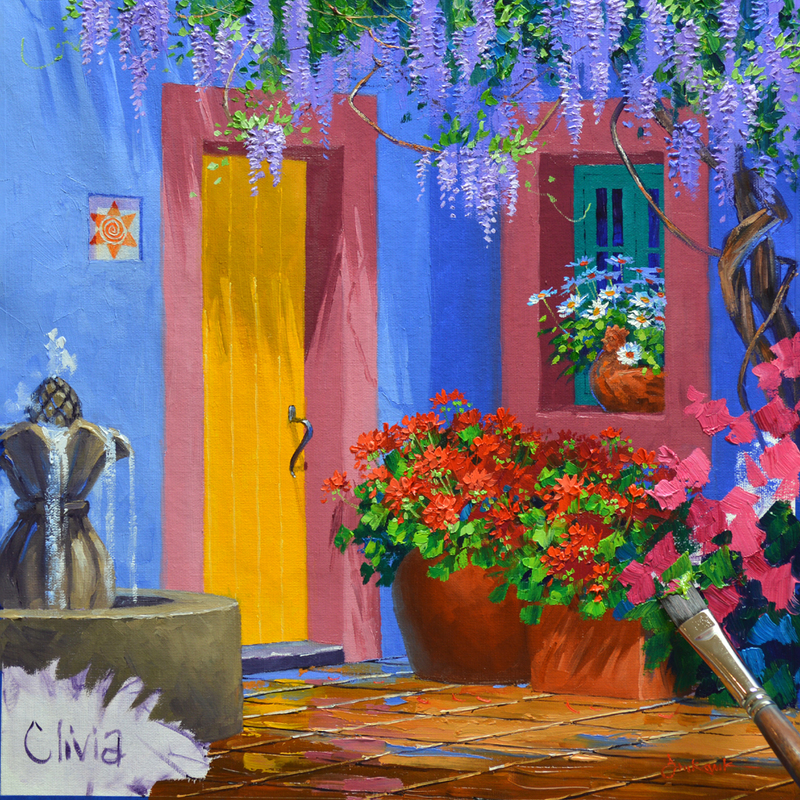 Definitely YES, I refer to photos or digital images for everything I paint. 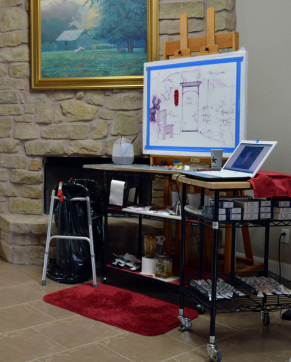 I put my laptop on the taboret next to the easel. This is our old studio but it allows you to see the setup. 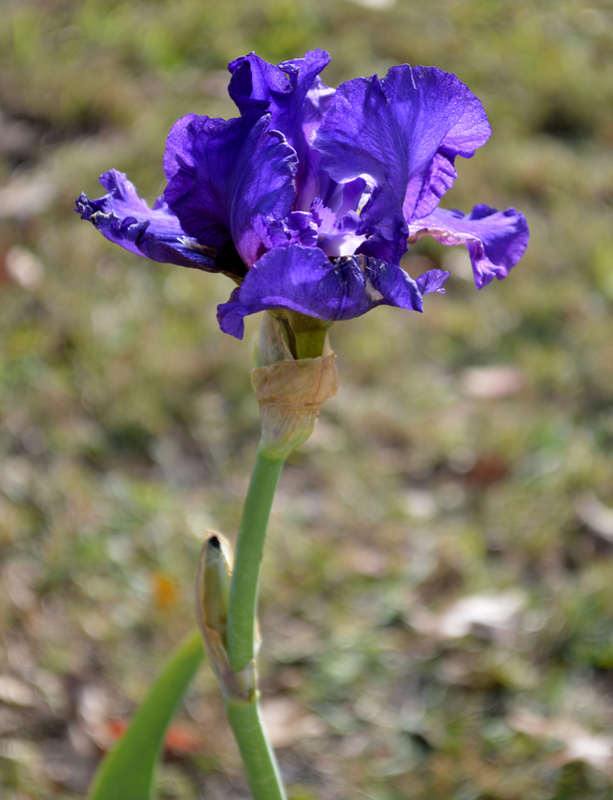 Before we get to planting I just wanted to share a couple of my Christmas Irises with you! The Sunflowers are blocked in with several different mixtures of Yellow. 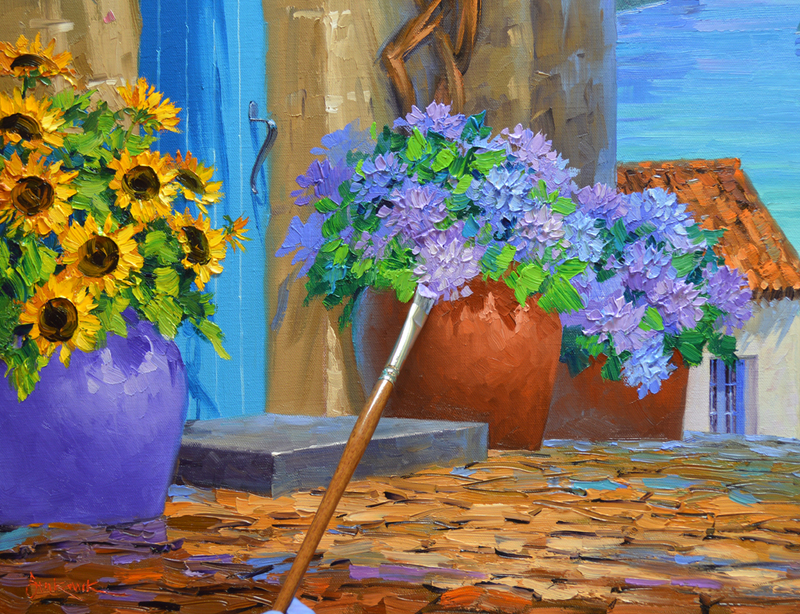 The variations of Cadmium Yellow Medium + Cadmium Orange, Cadmium Yellow Medium + MUD (Ultramarine Blue + Alizarin Crimson) and pure Cadmium Yellow Medium make the flowers appear more lifelike than if a single mix is used. 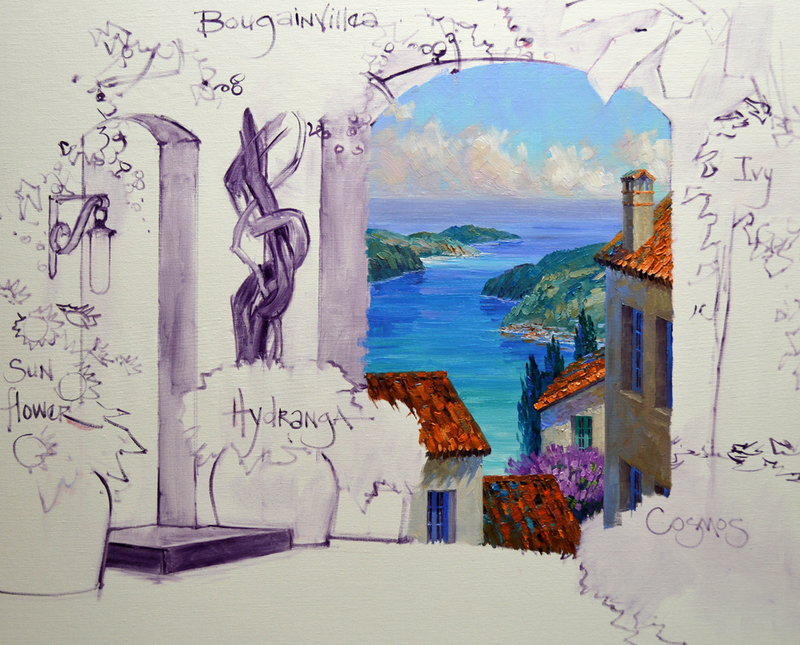 After painting the foliage with warm greens made of Ultramarine Blue + Lemon Yellow the large, dark centers are added. Don’t forget, you can click on this or any of the other images to enlarge the pictures. 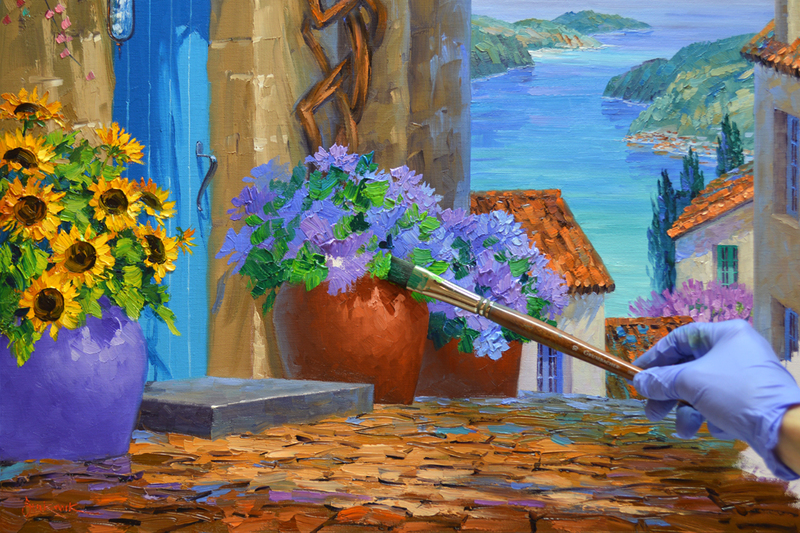 One of the most important elements for Joanne is the Purple/Blue Hydrangeas. The colors I’ll use are shown above. 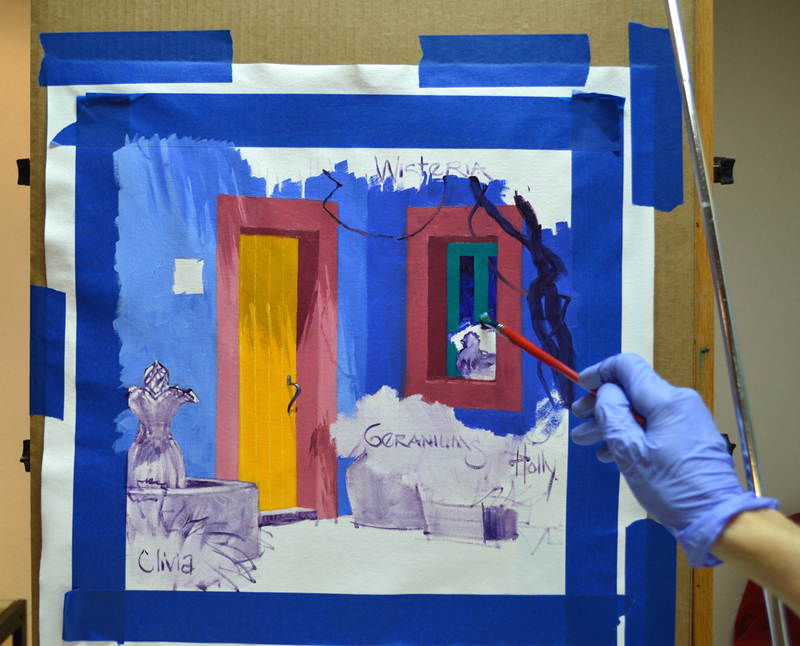 The grouping of mixes at #1 are all variations of Dioxazine Purple + Ultramarine Blue + White. 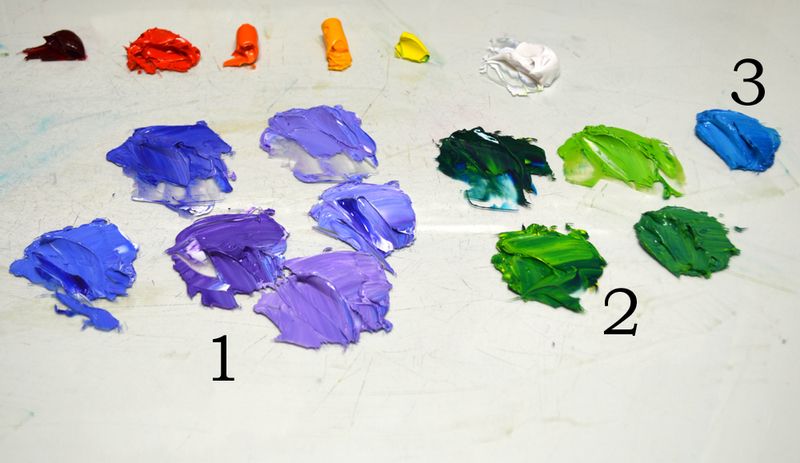 #2 are different combinations of Pthalo Blue + Lemon Yellow. #3. Pthalo Blue + White. 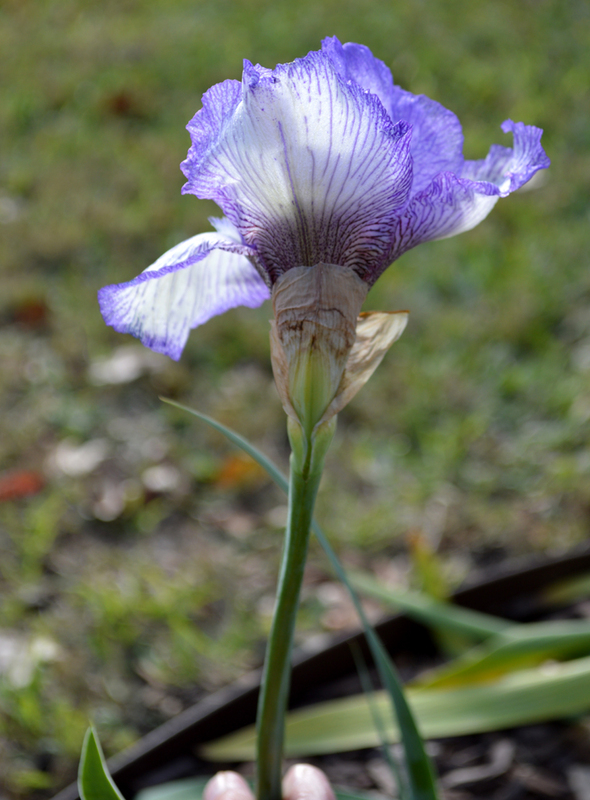 Following the same sequence as on the other flowers the blossom color is blocked in first. The different colors are applied randomly to give the variegated hues that are characteristic of these beautiful plants. Then the rich green leaves are worked around the Purples and Blues helping to shape the flowers. The final step is to highlight the individual petals. I use the corner of a small, Bright brush. 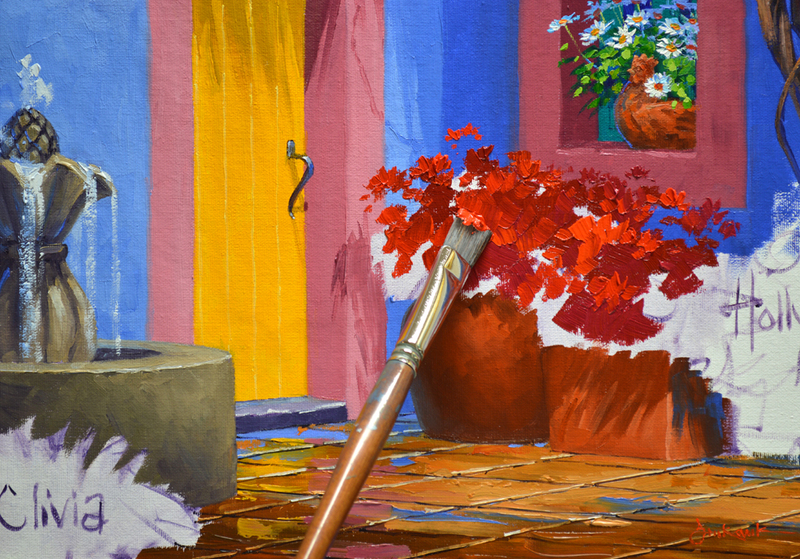 If you’d like to more about the brushes I use CLICK HERE. The Cosmos nestled along the base of the wall are painted with varying mixes of Cadmium Orange + Cadmium Red Light, Cadmium Red Light, Cadmium Red Light + Permanent Rose + White and Permanent Rose + White. 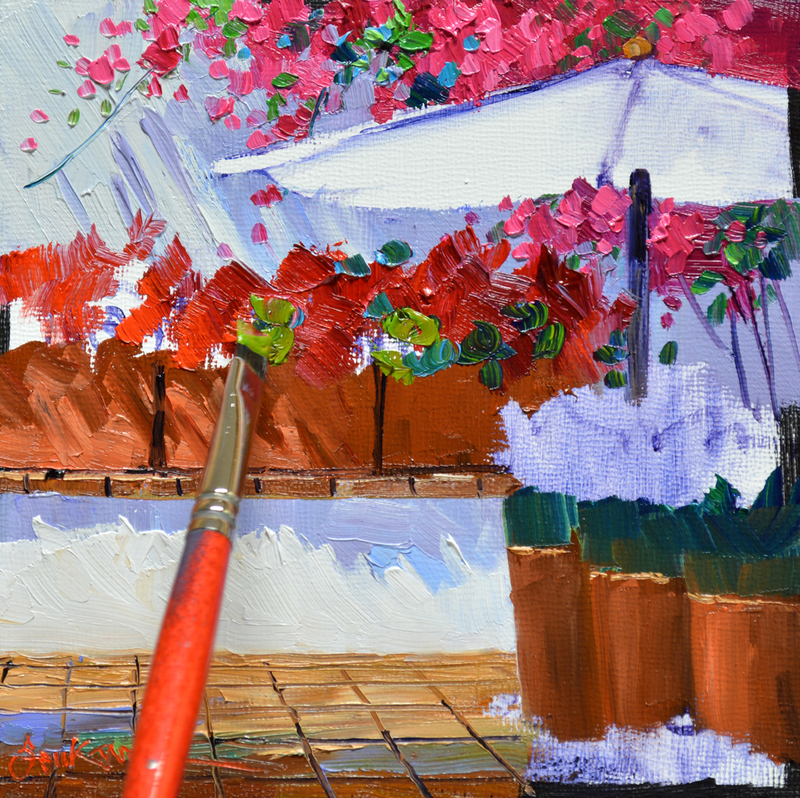 The Bougainvillea (we fondly call them Bogies 🙂 ) is made with mixes of Alizarin Crimson + Magenta + White. I follow my usual painting sequence of Flowers First, Leaves Last. By working in this order the colors of the blossoms stay crisp and clean. 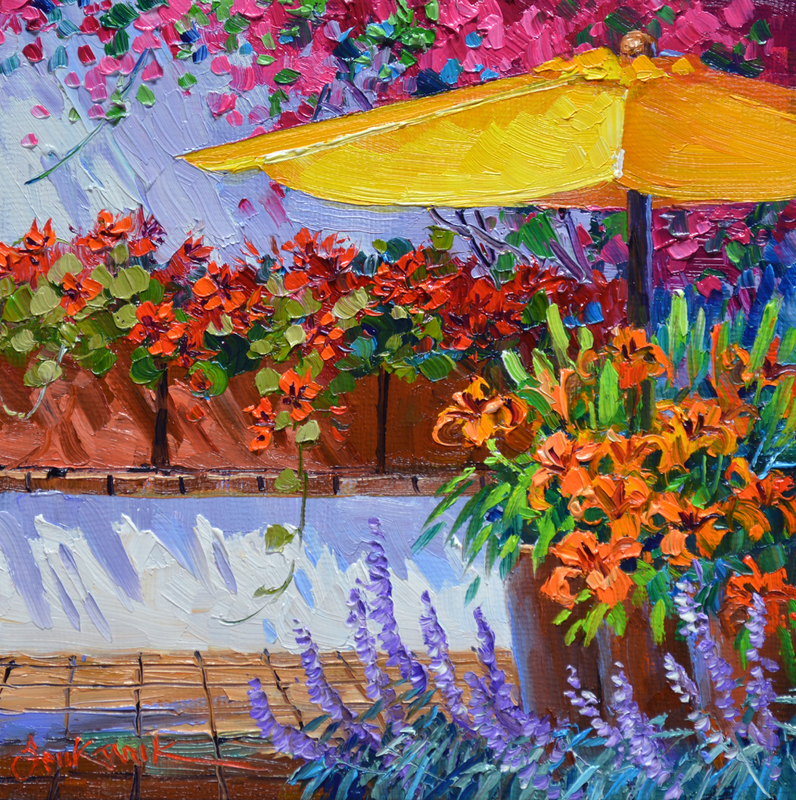 If the leaves were blocked in first the brush would pick up some of the green as I painted the flowers, muddying the bright hues. 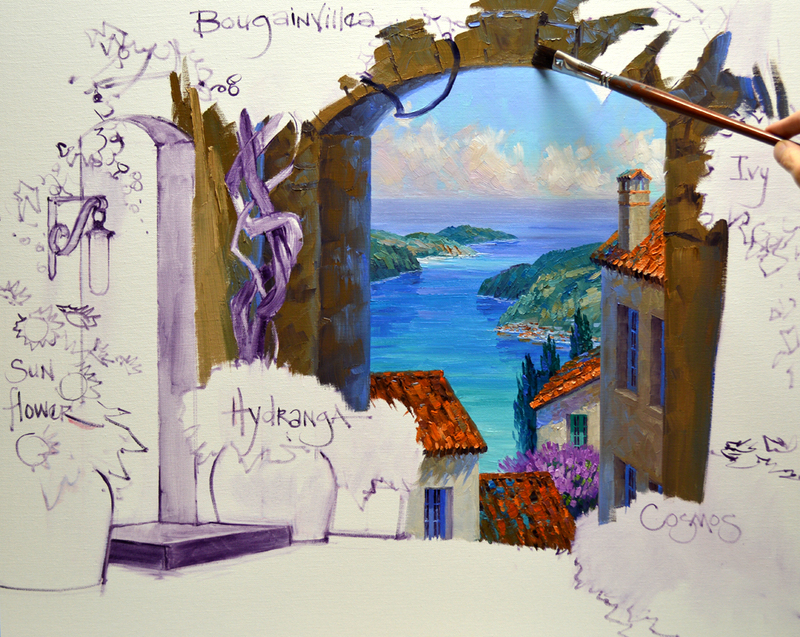 Now I go back in and work the greens of the foliage around the bloom color. The leaves are blocked in with a cool green made of Viridian Green + White. A few strokes of the door shadow color are made here and there to bring more coolness in the depth of the leaves. The large leaves of the Giant Bird of Paradise curve gracefully. I let one of them break the line of the arch, helping to increase the feeling of depth. 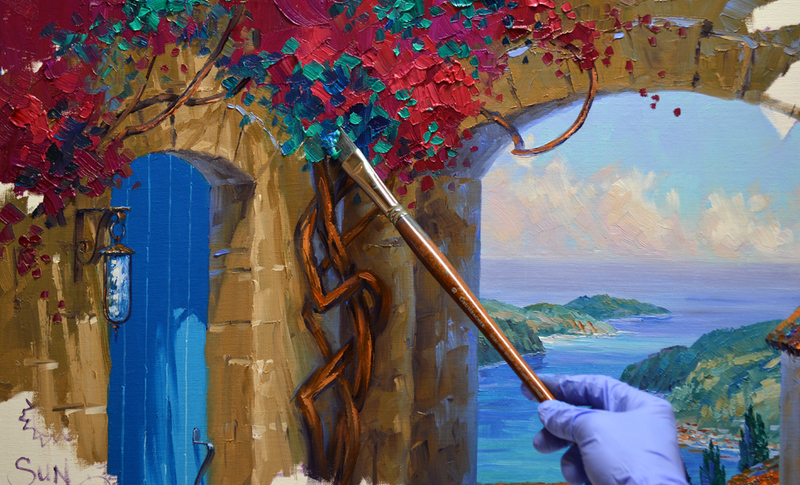 It’s so much fun to paint the Ivy’s heart-shaped leaves and long tendrils dangling down the rough rock wall. The initial block-in of the Cobblestones is similar to that of my terra-cotta tile floors. The light and shadow pattern is established first. 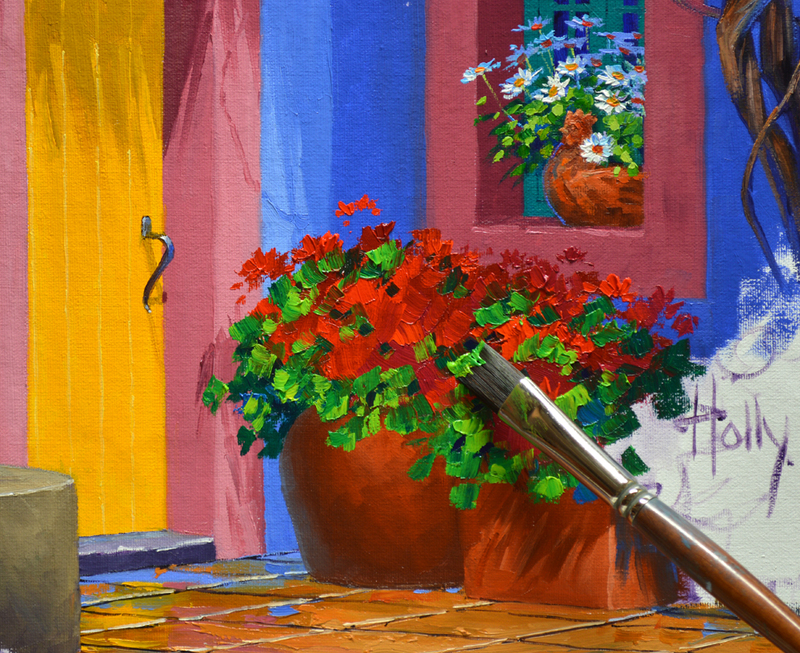 The main difference is the brushstrokes are made short and choppy with lots of texture. This helps to give the impression of the ancient stones. The crevices are now indicated. Like on the rock wall I don’t delineate each and every cobble, just enough to imply a bumpy, stone walkway. Please remember, you can click on any of the pictures to enlarge them. Jack and I are Rockin’ today after that big Dallas Cowboy win yesterday! WHEW, it was a close one but DeMarcus Lawrence pulled off the sack and fumble recovery to seal the victory. On to the Frozen Tundra of Packer Land in Green Bay. YIPPEEEE!!!!!!! Okay Mikki, that’s enough celebration. 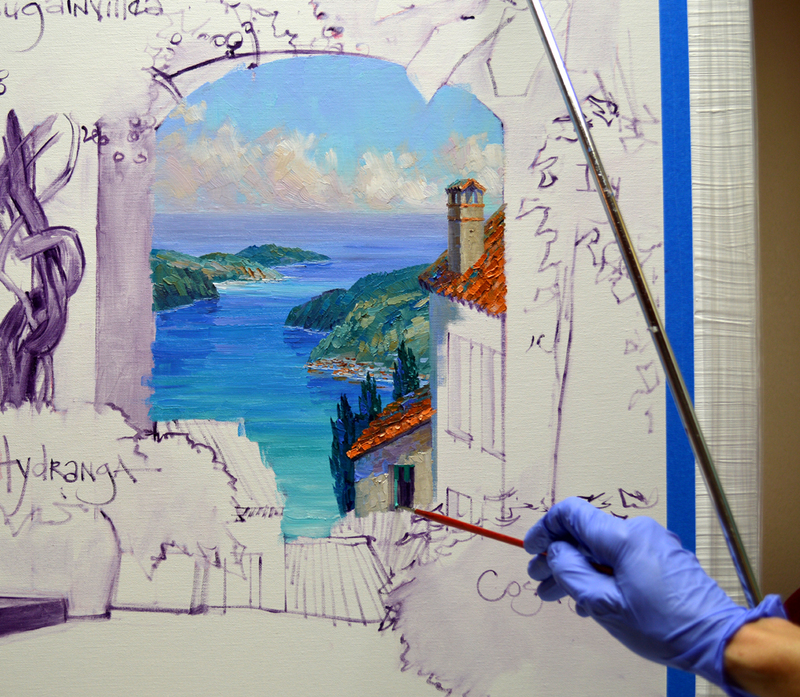 Back to the easel where we are going to be Rockin’ on canvas. 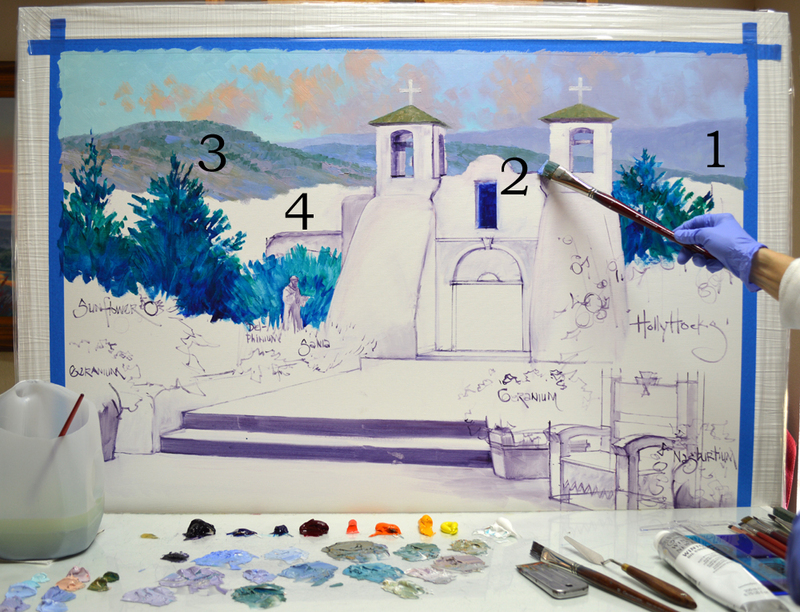 The grouping of adobe colors for the ancient rock walls are all made with various combinations of Cadmium Orange + a bit of Pthalo Blue + a little MUD + White. More MUD is added to make the darkest mixes. 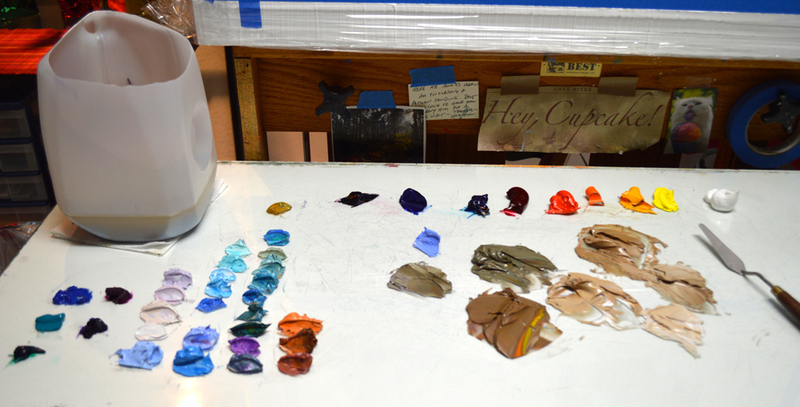 The colors lined up on the left of my palette are saved from previous sessions. The oil paint remains useable for several days. The walls are covered first, then I come back in with the darkest mix to indicate the crevices between the stones. 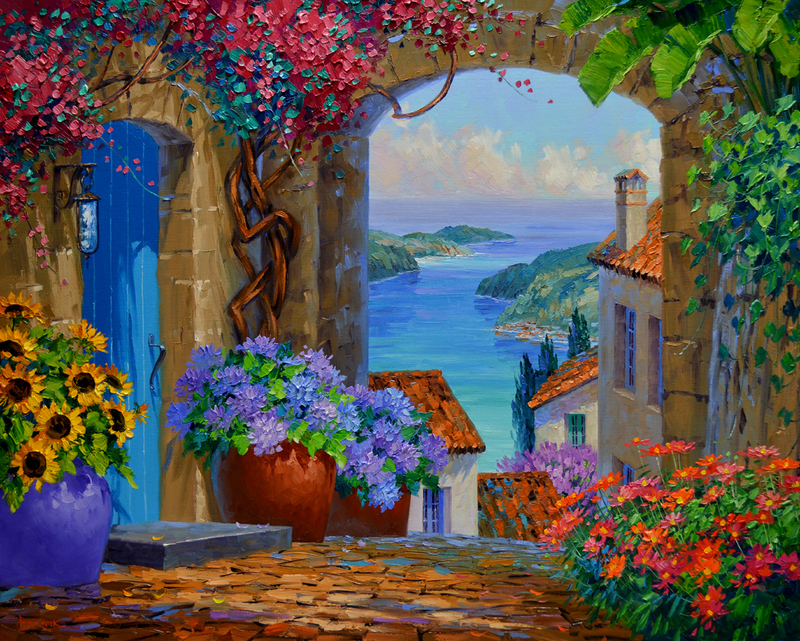 This is done very impressionistically. I want to give the feeling of an old rock wall, not outline each and every stone. The farthest end of the wall on the right is made bluer so it will recede. The upright surface is made warmer as it comes forward. 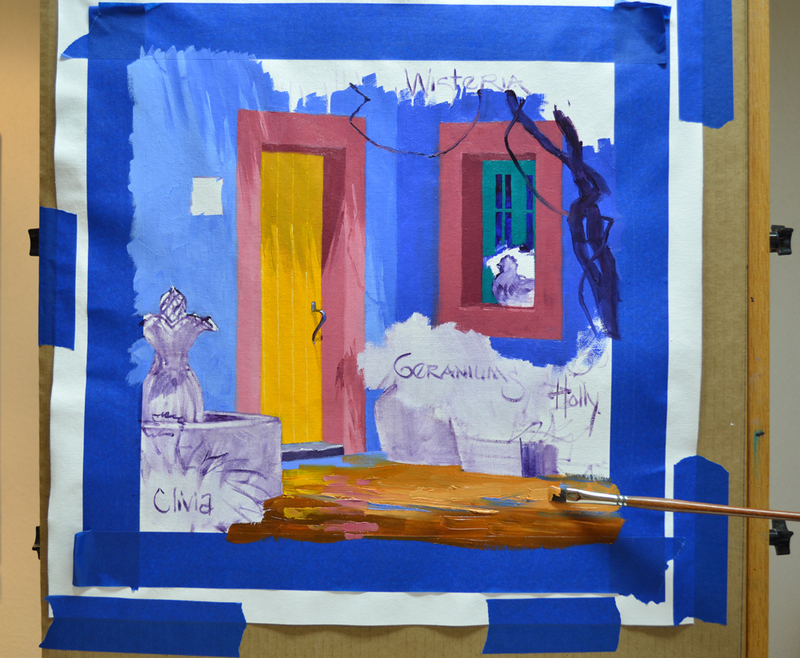 The door is painted with light and dark shades of Pthalo Blue + White. My arm is braced on the mahl stick to steady my hand as I make the lines separating the boards of the door. 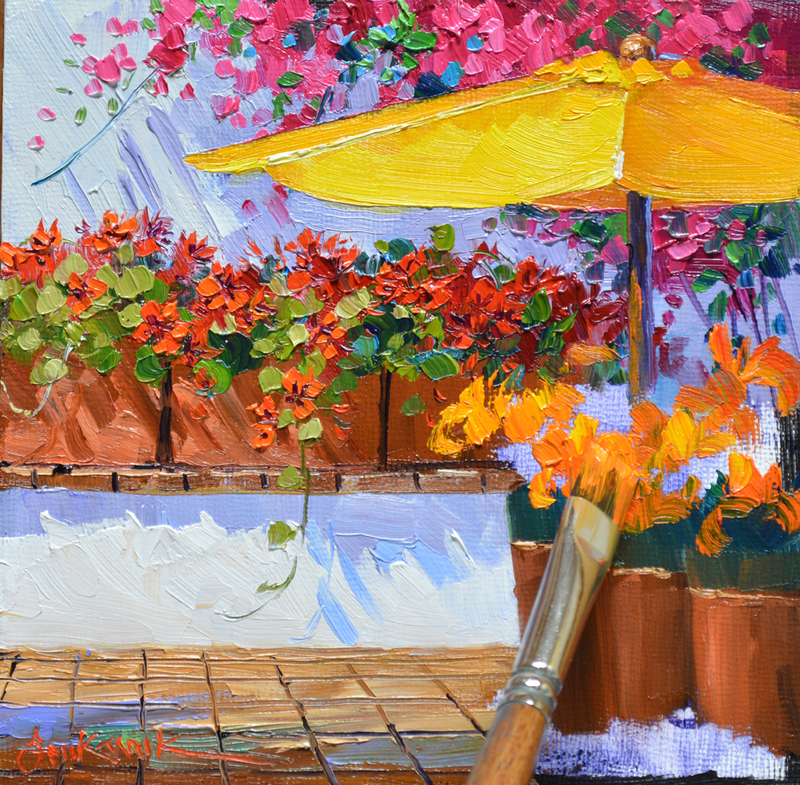 Today is a short painting day, our Dallas Cowboys are in the Wildcard Playoff Game this afternoon! I concentrate on the distant buildings, making certain to use cooler mixes of Cadmium Orange + Ultramarine Blue + White so they will recede. 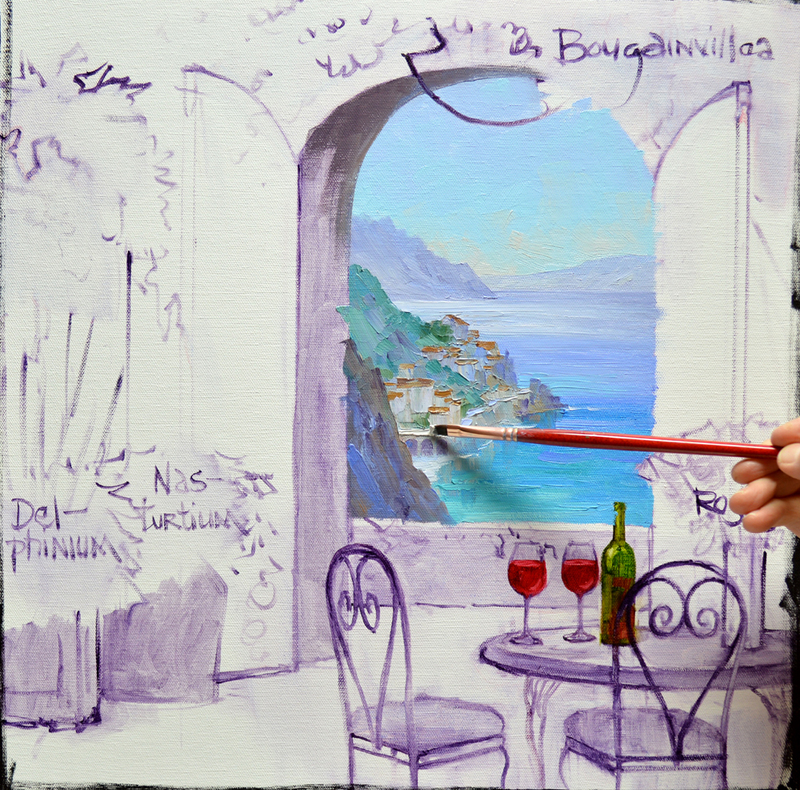 My wrist is braced against the mahl stick to steady my hand as I delineate the window. The combination of Viridian Green + White makes a nice, soft green that stays back. 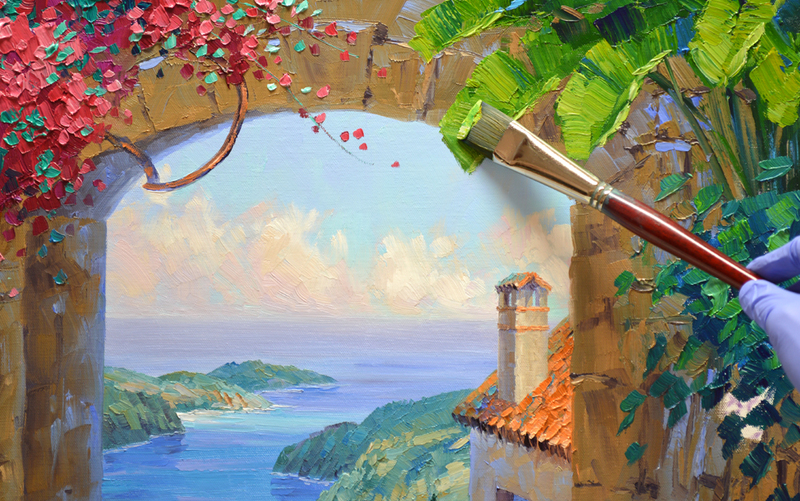 Terra-Cotta rooftops are painted with various mixtures of MUD (Ultramarine Blue + Alizarin Crimson) + Cadmium Orange. White is added for the ones on the right that are washed with sunlight. Brushstrokes of Blue and Green that were saved from the water and bluffs are made, giving the feeling of moss covering the terra-cotta roof tiles. 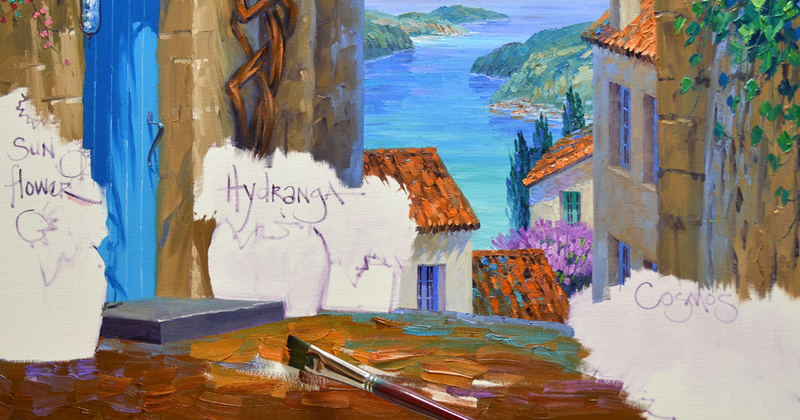 Holding the brush at an angle allows me to shape the paint to indicate the individual tiles. You can click on the picture to see it larger. 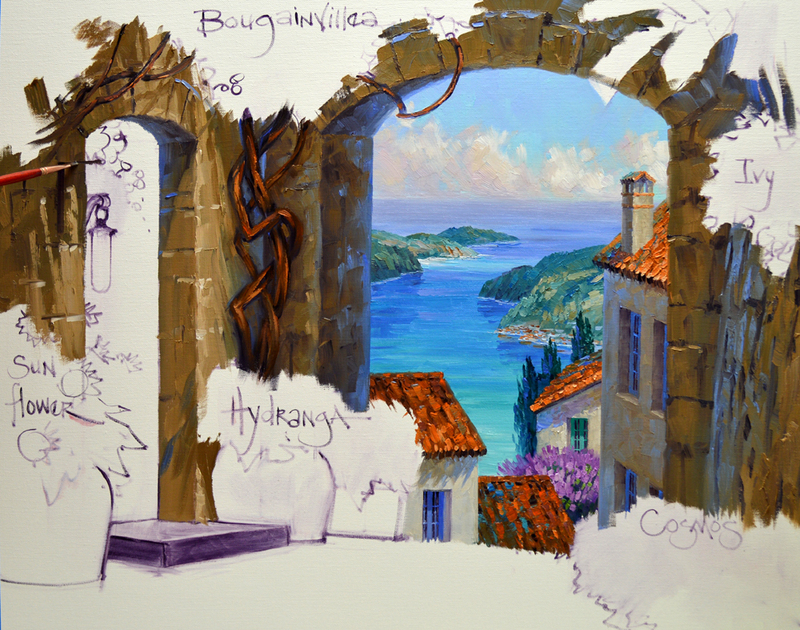 Jack and I love my ‘through the arch’ paintings at this stage. We think it looks so cool with the distant scene complete and the rest of the piece just sketched in. You can already see how the Warm Colors Come Forward, Cool Colors Recede rule is working. The ocean and bluffs start falling back now the warmer buildings and rooftops have been added. That’s it for today, have to get my game face on! GO COWBOYS!